As you have noticed it has been incredibly quiet around here….for years. 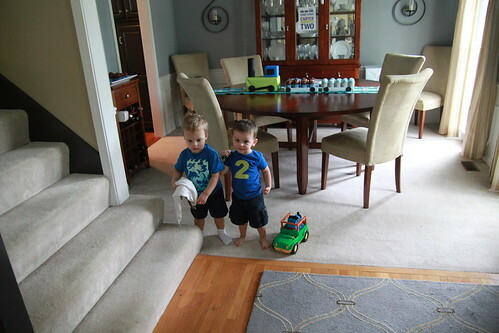 Once little boys came into the picture, writing and documenting our home redesign adventures fell by the wayside. We were still creating, but doing it 100% for ourselves and did not focus on writing it up. But the last couple of years, something incredible has happened. I started to paint and I fell in love… and people loved what I was creating. So much so that I painted more and more. And eventually was able to leave my job as School Psychologist in May of 2018 to pursue my art full time. Since that has occurred, my creativity has grown leaps and bounds and I am so grateful that I am able to create everyday. For my job. However, one of the reasons I was drawn to painting was I value beautiful and colorful spaces. I love the process of painting, but seeing my work help to make a space come alive is possibly even better. I still want to share our home projects with all of you (now that involve a lot of art), but I am now going to do it on my website- . 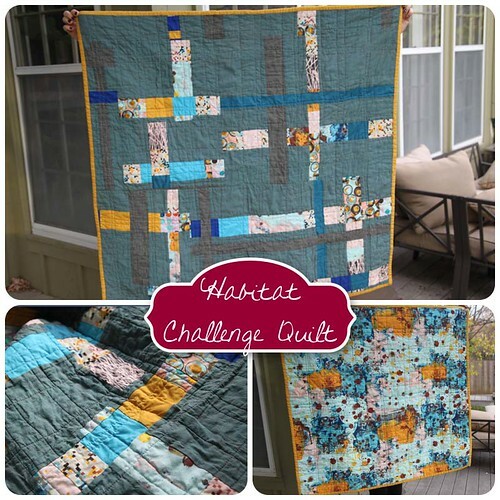 I hope you join me over there to see what we create in our home next! 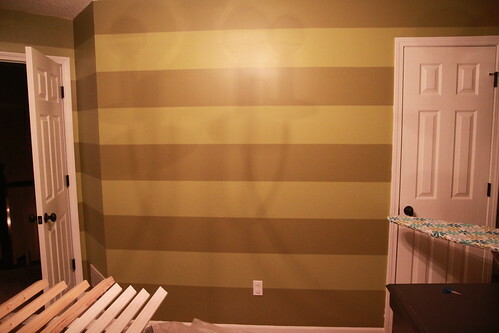 I loved the stripes in my old craft room. 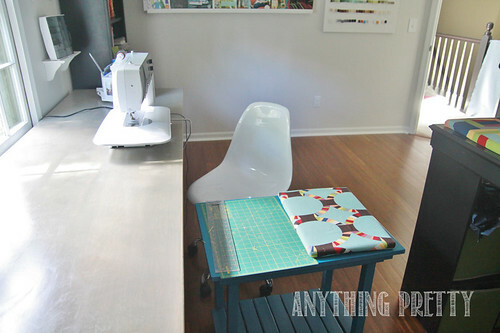 But I needed more sewing space, especially with my new machine. 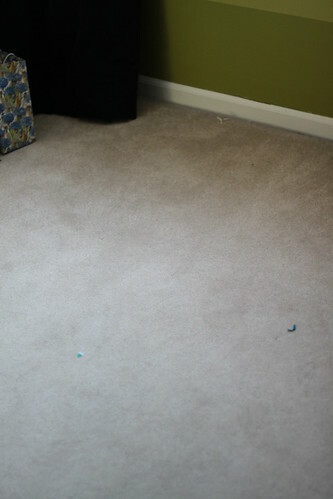 And the carpet was a minefield of hidden dropped pins. 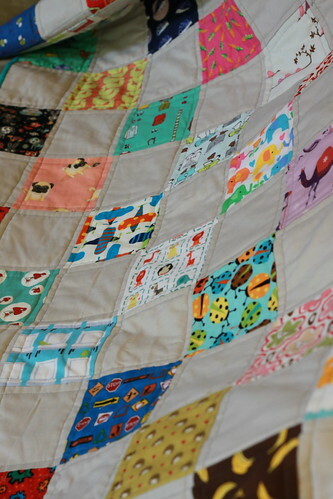 Also very difficult to keep clean of thread and craft crap. At least that is what my excuse was. And since there was so much going on in the space, I was wanting some clean and bright walls while we were at it. 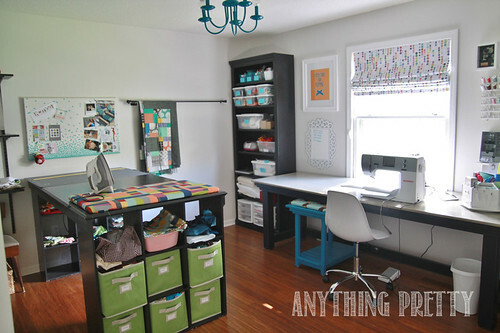 So here is my new craft/sewing space. Quite possibly my favorite room in the house. Because I love to be in there. 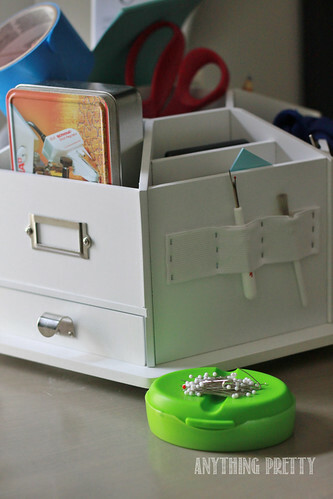 Because it super functional for my sewing/crafting wishes. And because it is pretty to look at. It is this clean and organized all of the time. Insert sarcasm font. Here is what we originally started with when we moved in. 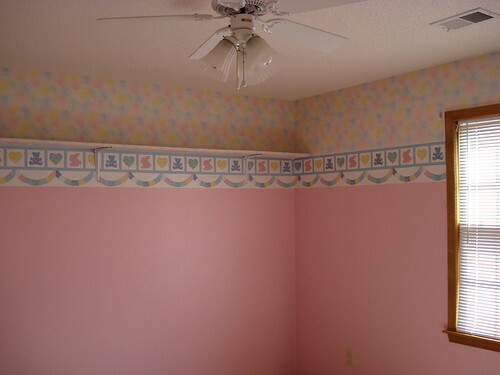 Pink and wallpaper. 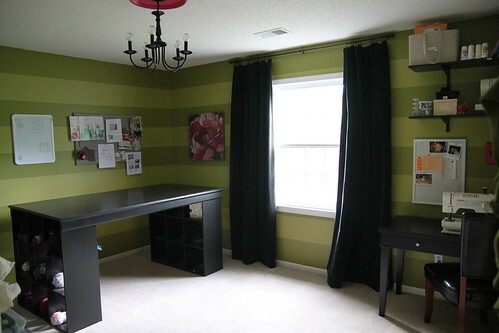 And then here was the stripes and small table of the original craft room makeover. So let’s start with the big stuff. 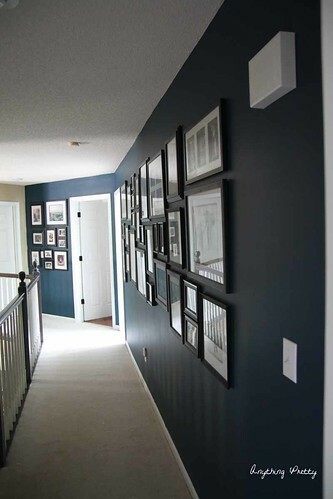 The walls are painted with the leftovers from the basement- Sherwin William's Eider White. And the floors are a bamboo hardwood. I had a minor freakout the night before the were installed that they were going to be too orange. As in Honey Oak orange. I may have been seen laying out a whole section of the wood out of the box on top of the ugly honey oak ones in the kitchen. At midnight. To judge if the oranges were different. 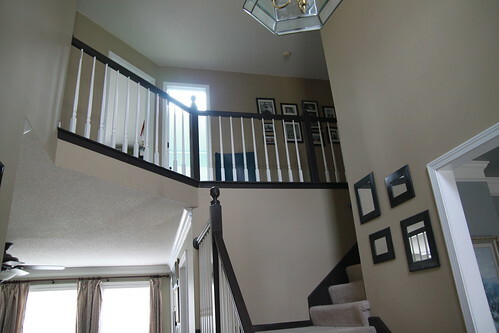 But after they went in I love them and they are so much nicer than carpet in the space. Just a quick sweep and they are clean. At least the floor part. Derek made the amazing massive sewing table modifying this plan from Ana White as well as the smaller table that pulls out to give me an L shaped workspace and so that I don’t have to constantly move up and down. Life-changing. Both the space on the table and the ability to swing my chair to the side for a quick cut or press. He knows the way to my heart is building furniture and he does it so well. 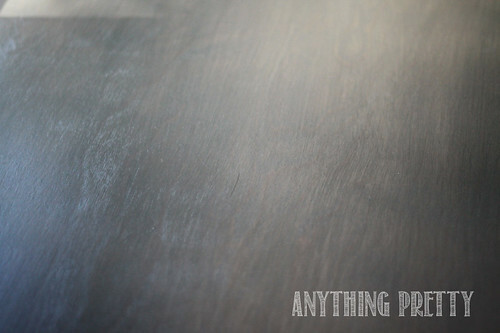 I painted the bottom of the table solid black and glazed the top with a gray paint using my tried and true method with gray acrylic paint. It is difficult to get a good picture of the finish next to the window, but most people who come into the space think that it is stone before they run their hands over it to see it is wood. That was not my intention with the glaze, but I love that it turned out that way. 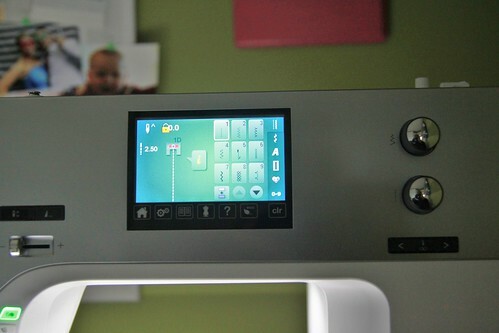 I love that my machine is directly in front of the window so that during the day I can look out into the backyard. Let’s also pretend that I just snapped that photo and the midwest is looking that green this time of year. Now let’s take a spin around the rest of the room. The cutting table is the same, just spun around. It still gives me a lot of floor space (and enough room for an air mattress when we need an additional guest bed). 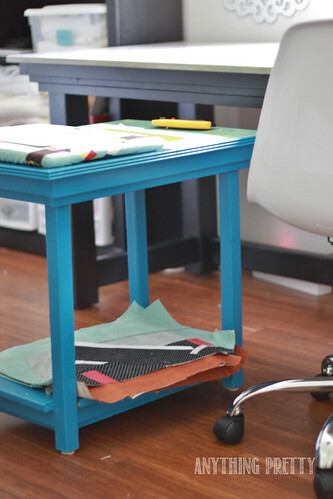 I got rid of the ironing board, but added a an ironing space modifying this tutorial, making it instead with just a piece of plywood rather than an entire table. The cover is removable like a fitted sheet for washing purposes. 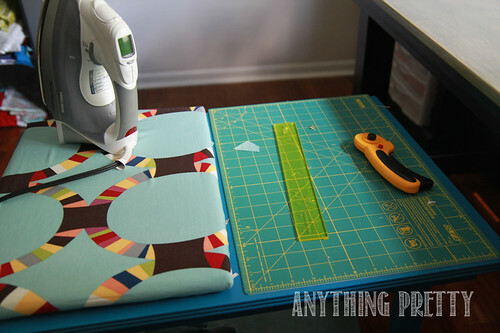 And when I need a really big cutting surface, I just take off the ironing board. 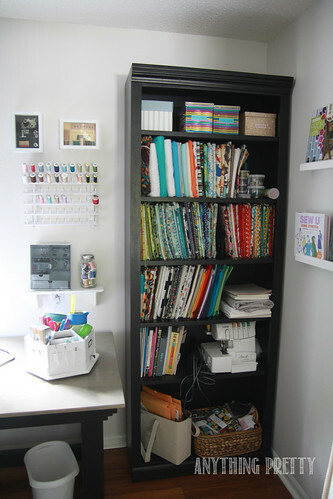 My fabric scraps and works in progress are housed in the cubbies underneath. 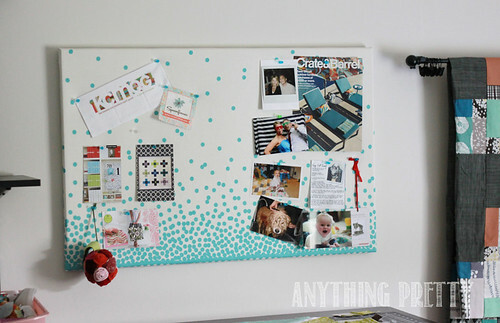 My bulletin board is simple…a cork board with fabric stapled around it. 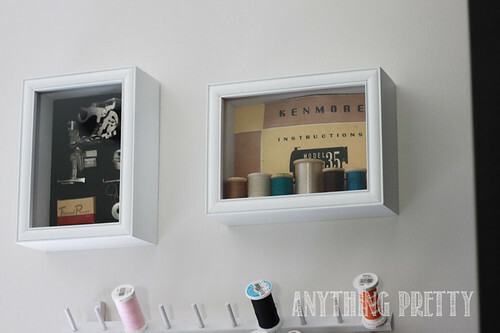 My grandmother’s sewing accessories are in shadow boxes on the wall and I recovered her sewing chair for an extra space when friends come to sew. It is tucked into the corner. My design wall remained the same. And the Kona color card moved next to my bookshelves. 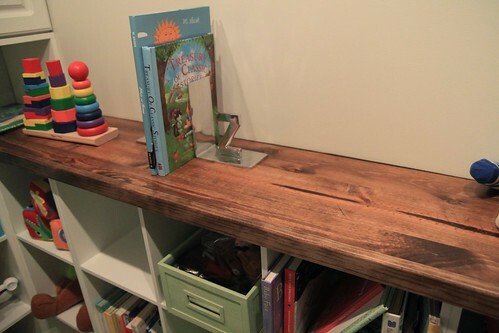 Derek made some simple forward facing bookshelves like these to hold a sampling of my craft/sewing books. 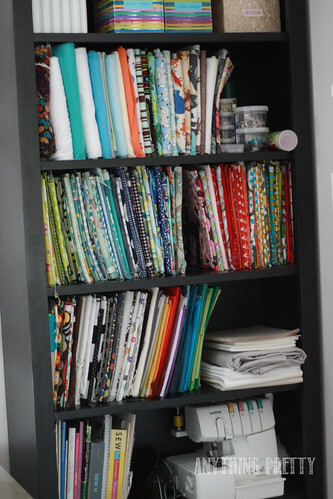 I have found seeing the covers instead of just having them stacked on a shelf reminds me to use them more-either for specific projects or just for the general inspiration of pretty pictures. Not all of them fit, but I rotate them around with ones stored the typical way to keep things fresh. 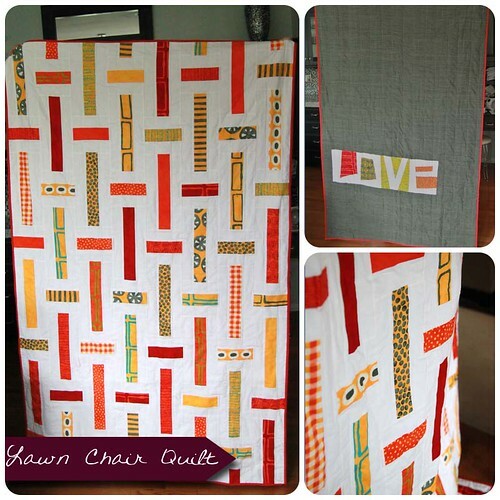 The roman shade is also DIY with selvedge fabric from Spoonflower. 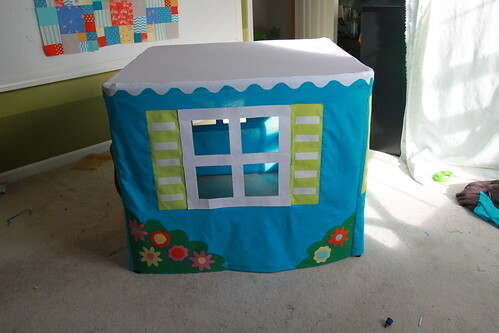 I loosely used this tutorial and backed it with blackout lining so it can be dark in there for people to sleep if the space is needed for another guest space. 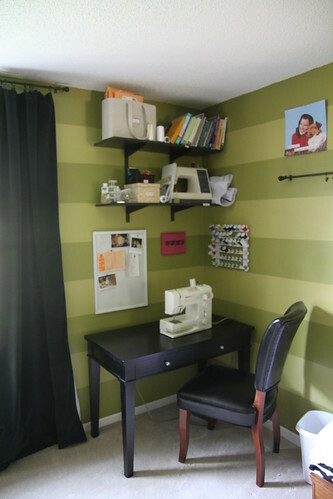 And that print is just perfect for a sewing room. 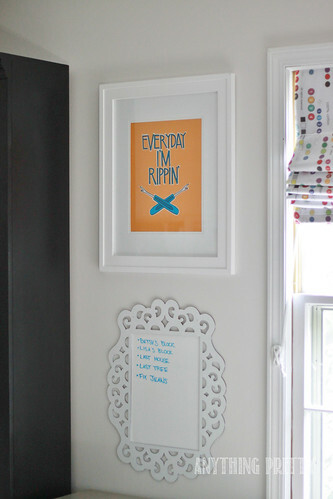 Also above my sewing table is my friend Lauren’s print. I love the colors and the sentiment. And some more organization pics if you are into that. 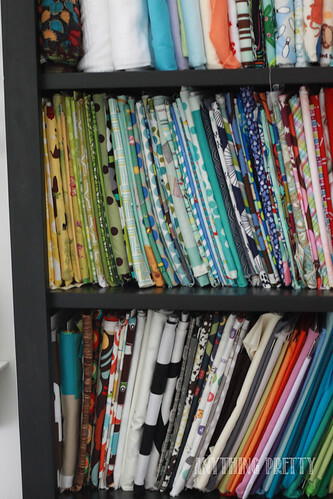 I keep my fabric organized using the mini bolts method as explained here. It has helped so much with finding what I need. The top shelf is fabrics other than cotton. 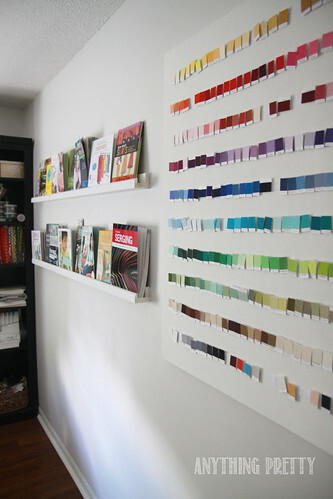 Then my prints organized by color, with some subsections (i.e. Christmas). 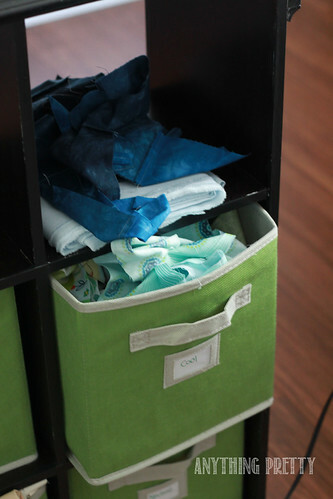 And then my solids organized by color. Don’t worry, my stash has increased a lot since I snapped these pictures. Especially the solids. My serger is below that. 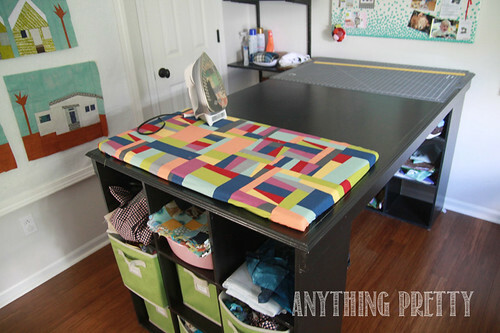 My sewing table is so big, I also can keep it out if I am going to be using it frequently. 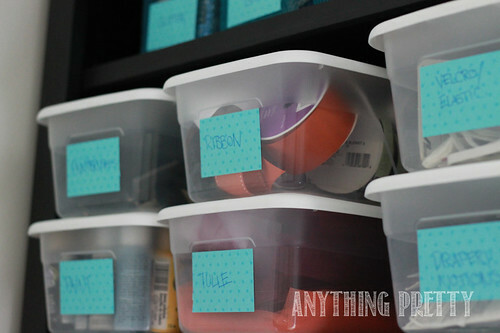 My precuts and patterns are on the bottom shelf. 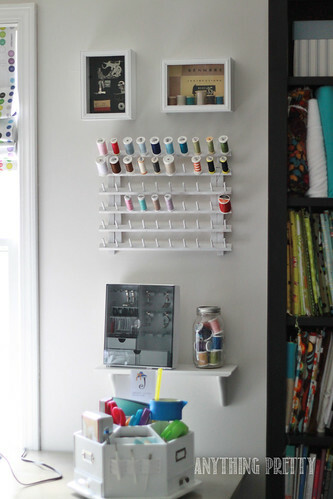 Non-sewing craft supplies and batting are on the opposite bookshelf. 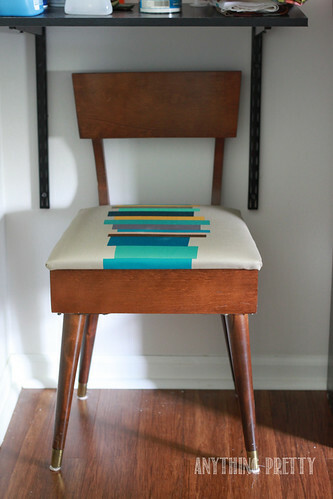 And rulers, ironing supplies and large amounts of fabric are on the shelves over the chair. Whew! Sorry for the picture overload, but I always love looking at where people create and how they organize. 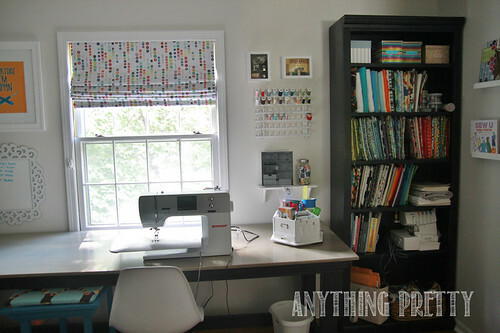 I have learned a lot about how I want a space to work for me when I am sewing and crafting and I think this space fits the bill perfectly. I think I named most of my sources, but let me know if you are curious about something I missed. Hope you enjoyed the tour! 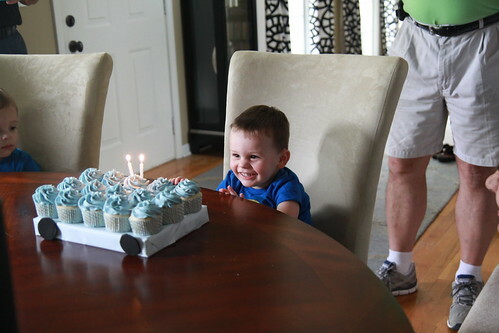 So my baby turned 2. Which makes him not a baby anymore. I thought that last birthday, but this time it is really true. Picking a theme for this year’s party was simple. 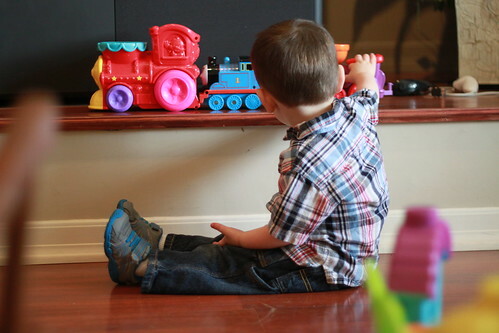 This boy loves his trains. Big trains. 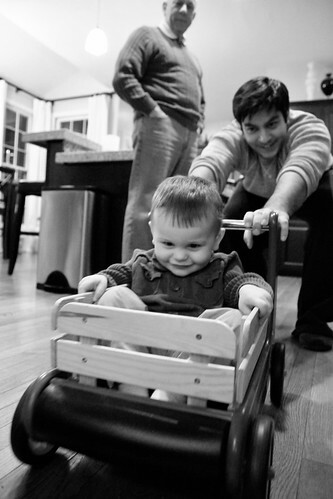 Little trains. 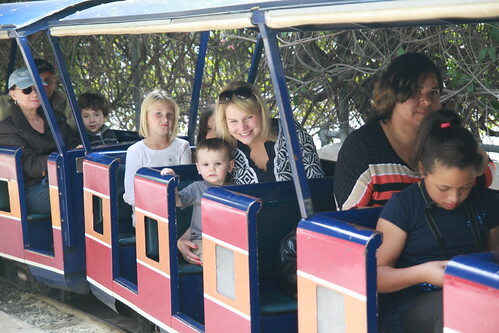 Real trains. 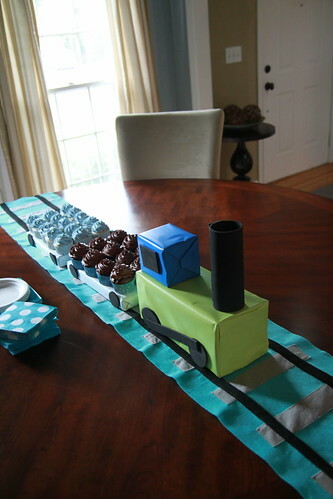 Toy trains. TV trains. Train Whistles. Train Tracks. But we also wanted to keep the party low key. 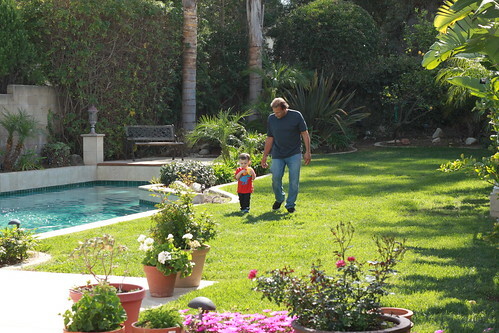 All he cares about is having fun with his family. 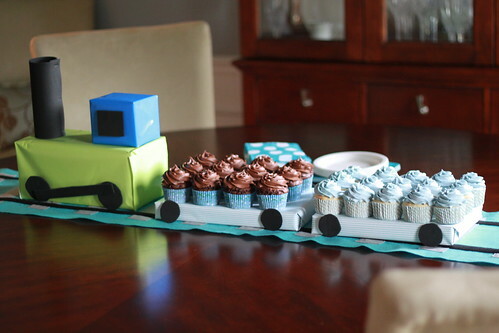 He won’t remember how much time and money was spent making him an elaborate birthday cake. Or how many people were there. So no going to Pinterest for ideas. And repeating the mantra…keep it simple…keep it simple…keep it simple. The invitation was a quick and easy find off Etsy. 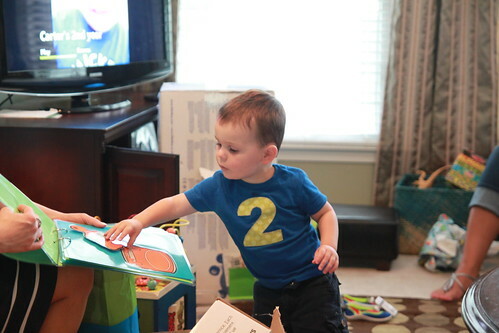 Carter loved his and carried his own personal copy with him for several days. While the making the proper “choo choo” sound effects. I took that as his approval. 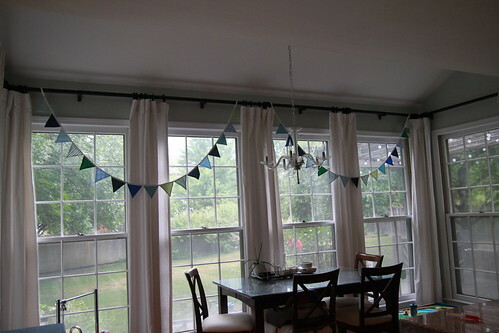 We reused the the fabric buntings from last year’s party. 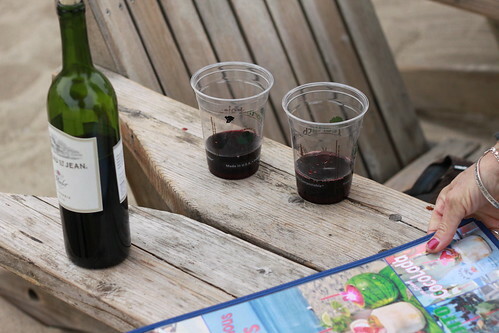 Simple party tip-keep the color scheme the same and reuse all of your crap. 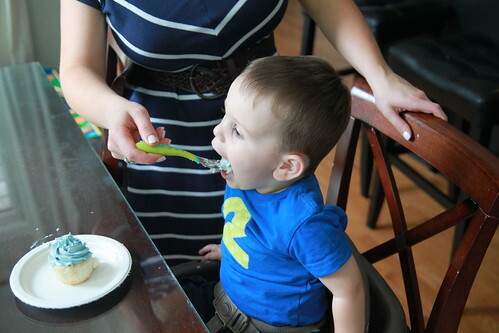 This kid is going to have a blue party until he is 15. I appliqued a “2” on a blue t-shirt for the birthday boy. In case any one was going to forget how old he was. I had not done applique before and it was quick and easy. Well after I remembered to make a mirror image of the “2” I printed out. Otherwise it will be backwards. Not that that happened. Instead of a cake, we ordered cupcakes from a friend. And I constructed a train out of cardboard boxes, wrapping paper, and foam. Much easier materials to work with than cake and fondant. 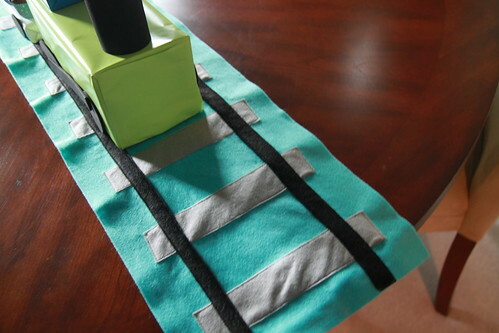 The table runner is made out of felt. 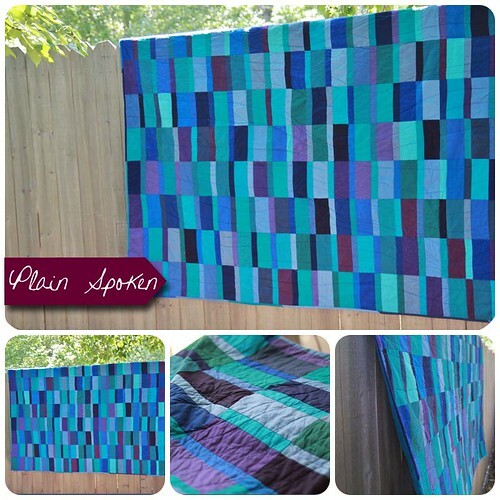 I bought a half yard of the blue from a craft store and cut it into a long strip. 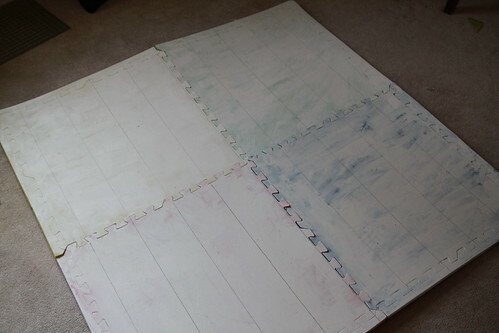 Then I used three pieces of gray felt that you can buy in the squares to cut railroad ties. A couple of strips of black later we had a railroad track. My original intention was to make it no sew and just use heat n bond to attach it. 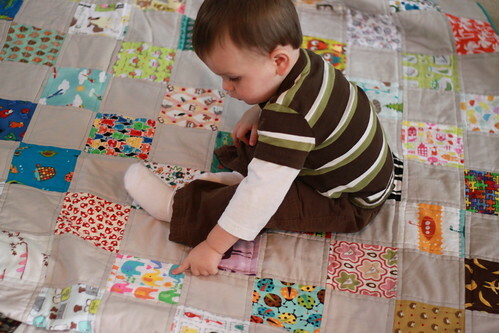 With the idea that I would just sew it later if he really wanted to play with it. I had gotten to the third track with heat n bond when I decided that was a stupid idea. Was there any doubt that Mr. Train would leave it alone? Out came the sewing machine. And it was a good decision considering this was the scene in our family room the day after the party. He may have that at his parties until he is 15 as well. 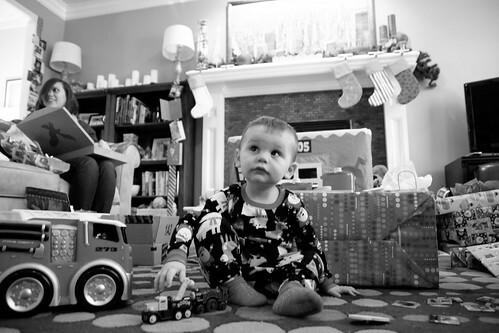 In the background we played Carter’s favorite movie of all time. Volume 2. Like last year it was a compilation of pictures and video clips from his past year. It took quite a long time to organize all the pics and put it together so this may not be a tradition every year. 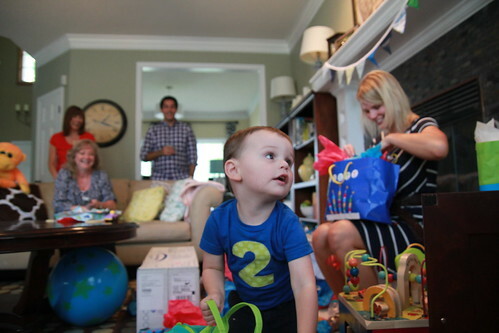 But he was enthralled. Even when there were presents to be opened. 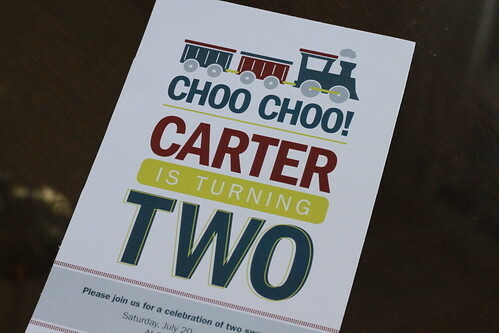 And since most of the guests were grandparents or other family members that would be interested in watching a hour long Carter movie, we also had some as favors. They at least pretended to want to watch it again. For food, we had a pizza bar. 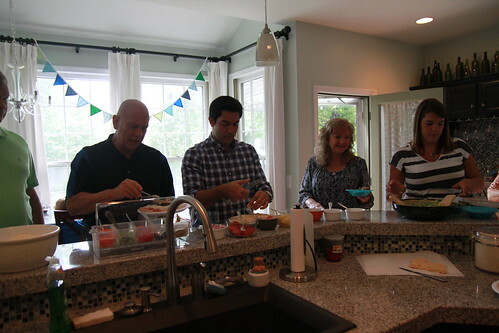 We made crusts ahead of time and everyone did their own toppings before we popped them on the grill. The strawberry basil margaritas were also a hit. 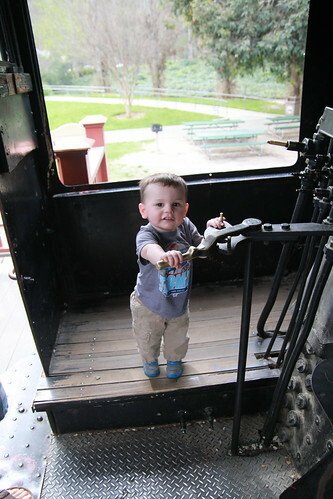 Overall I think he had a grand time with all his favorite people and a little bit of choo-choos thrown in. Sometimes it is nice to sew with some pink. And strawberries. And frogs. 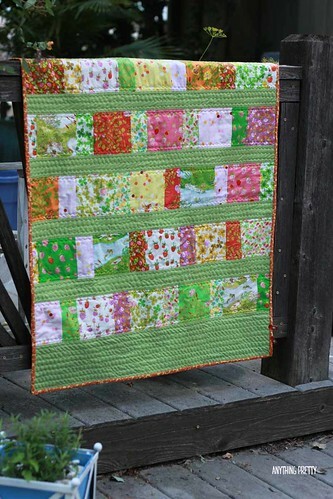 And sometimes it is nice to make a simple quilt and let the fabric do the heavy lifting. Especially when it is so pretty. 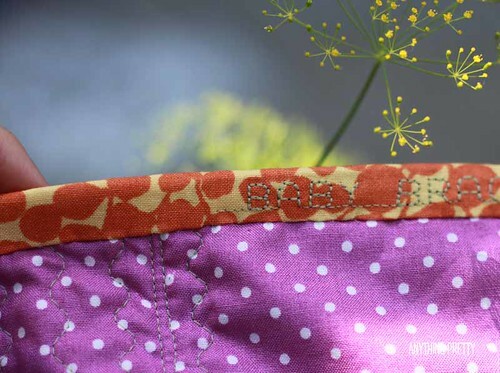 I spent a lot of time trying what to sew up with my charm pack of Briar Rose by Heather Ross. I had many ideas and a couple of them even made to the design wall. But I just did not want to cut it up too much. Those frogs. And the other whimsical goodies hiding the patterns. 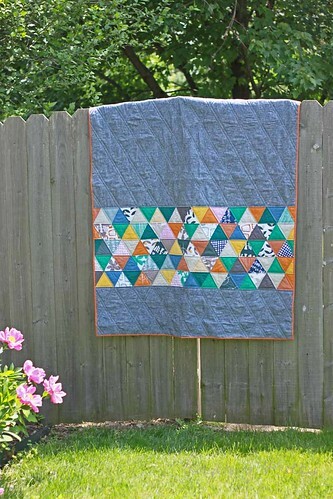 So I ended up a pattern I have done before-this quilt by Elizabeth Hartman. 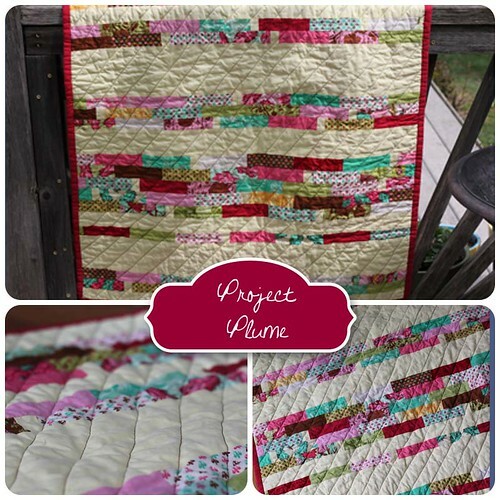 It is a great pattern for a beginner and the fabrics can shine. 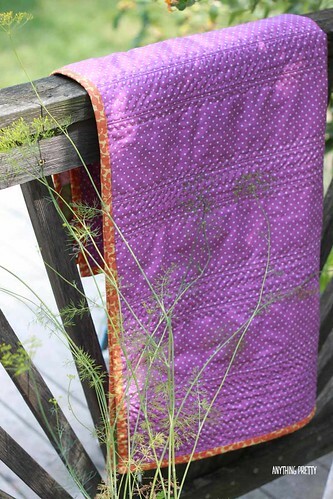 I quilted it with my favorite wave and backed it with some girly purple polka dot. 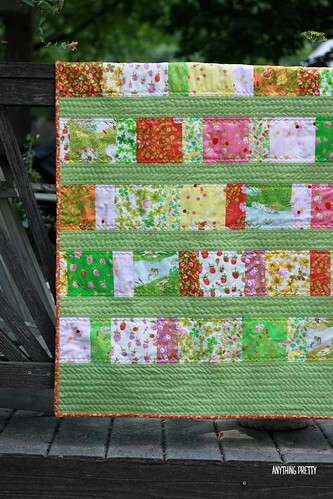 Since I do not have any little girls in my house and the little one who lives here already has plenty of quilts, this one is going to be a baby gift. 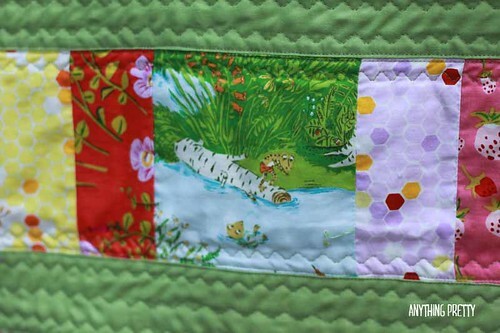 I copied my friend Jaime’s great idea and put the quilt label on the binding. It is unobtrusive and easy. Perfect. 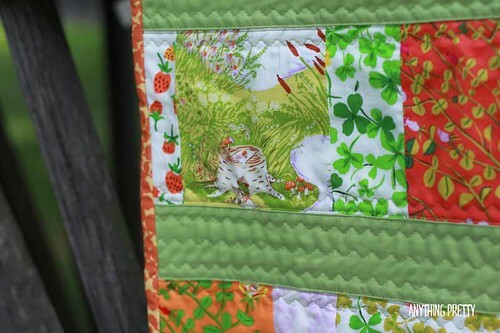 When the fabric line comes up later this month, I may have to get some more of those frogs. And maybe the strawberries. In a couple of colors. 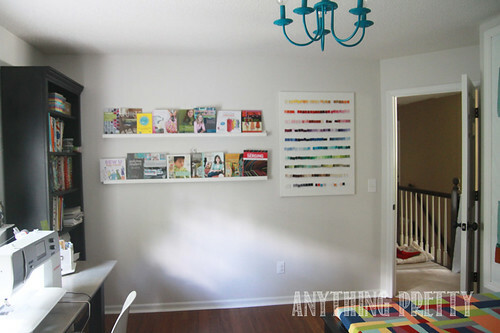 So we bought a gallon of paint and did a little mini-redo on the upstairs gallery wall. I was a little bit worried that navy would make the space look a little too dark. And that if we hated it we could not paint it back to the original color because we did not have it. 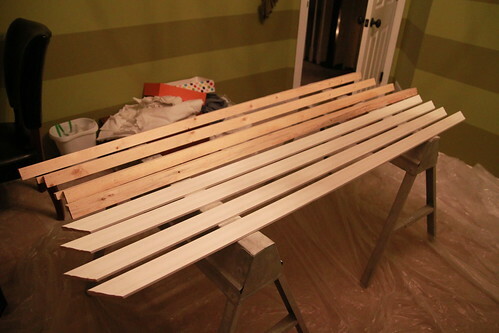 But I loved it from when the first coat went on. And now looking at the before pictures I love it even more. 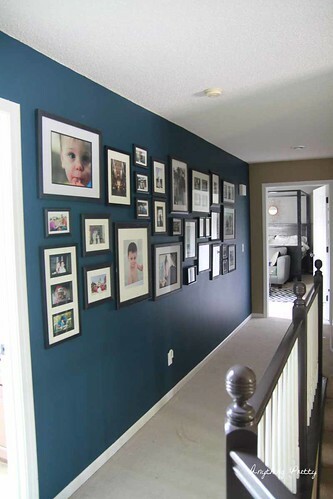 Painting a hallway wall was an easy and quick project that achieved in a couple naptimes. 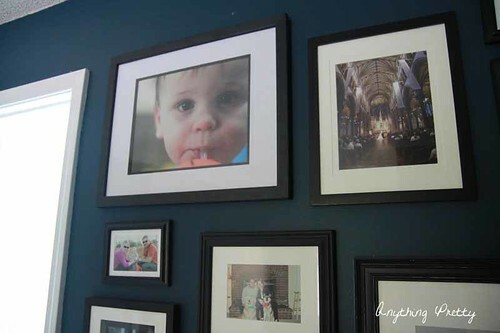 We added some more pictures and frames as well-using the old paper on the wall method. At night as you can see by the crappy phone pic. 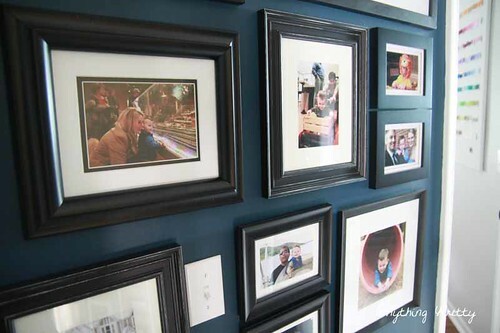 And I love all the new pictures that now got updated and added to the walls. 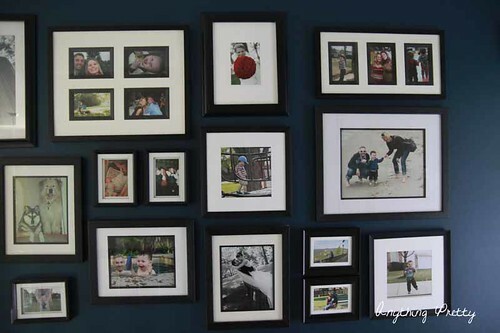 You can never have too many black frames with white mats. And a cute kid and dogs help too. Although one could make an argument a maximum number of those per house could exist. 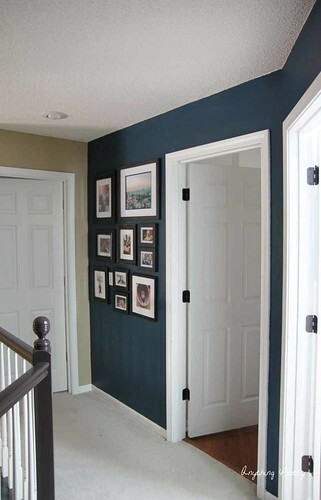 (Paint color is Rainstorm by Sherwin-Williams). Anyone else wanting to paint something navy? We needed some drapes. And I did not like what I could find in stores. Or they were too expensive for my budget. Most likely it was the latter. So I got out my mom’s 1985 sewing machine and decided that I could just learn as I went. Sewing is a good DIY skill, right? 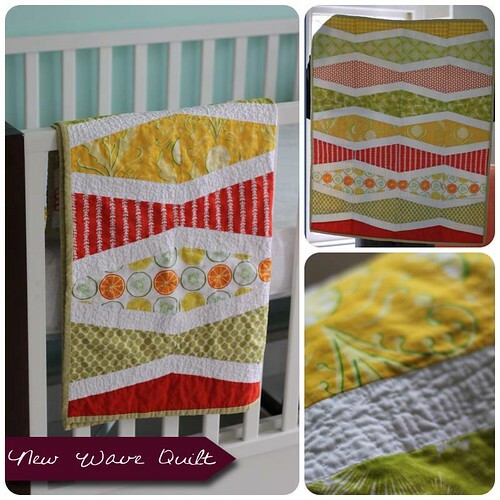 And when friends started to have babies, I thought baby quilts would be something fun to make. 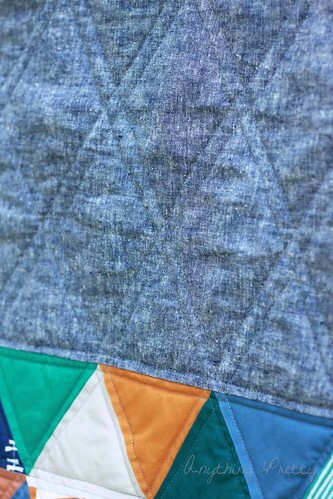 A couple of years later, modern quilting has become one of my favorite hobbies. That along with buying fabric for aforementioned quilts. And I now hate sewing drapes. Go figure. 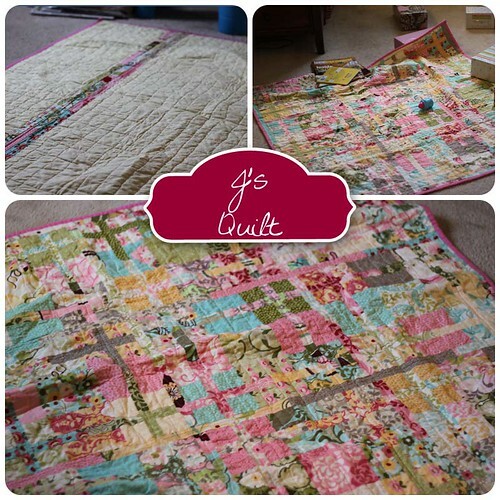 So here are my quilts-newest on top and oldest (and with much poorer sewing skills) on the bottom. Click on the pictures to go to the full posts. 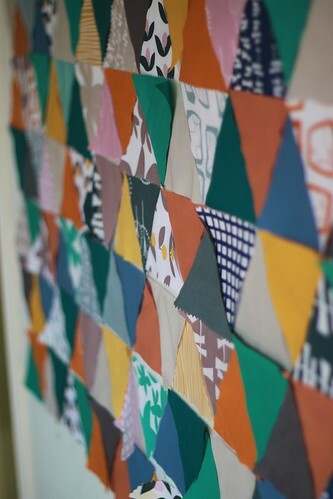 These Glimma triangles have been sitting on my design wall for a long time. Possibly since January. 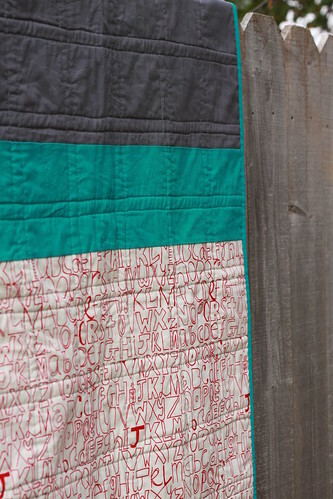 And they finally made it into a quilt. For us. That will stay in our house and we snuggle under watching TV. Possibly my favorite kind. Right after the kind that little boys snuggle under. 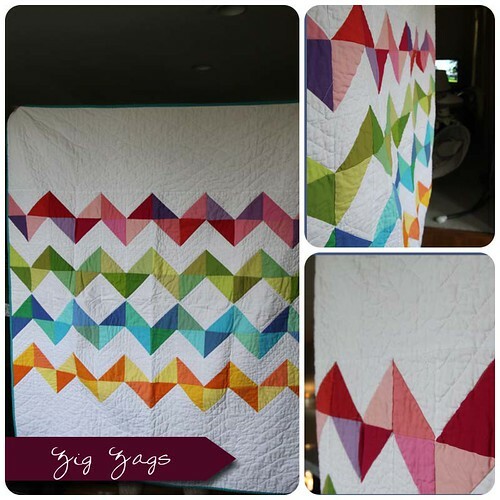 It was a super simple quilt…just a charm pack with some solids from my stash mixed in and cut into triangles. I used the cardboard that came with the charm pack as a triangle template and hacked away. 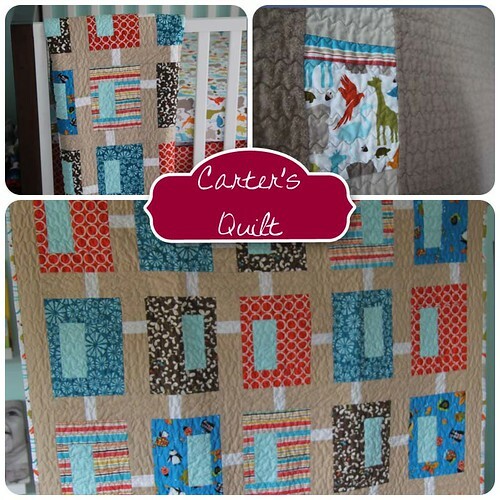 The solid is quilter's linen and I love how it looks as well as how soft it is. 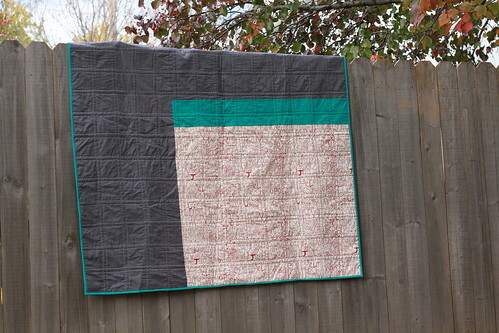 This is the first quilt I quilted with my new machine. 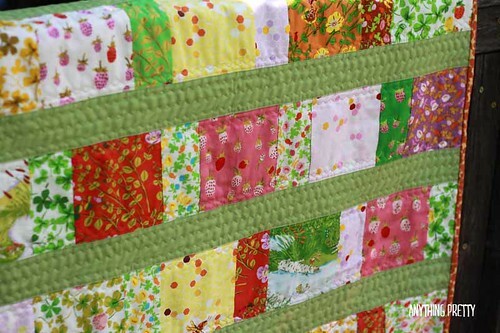 Quilting used to be one of my least favorite parts of making a quilt. Not anymore. I wanted to keep it simple and just did straight lines. 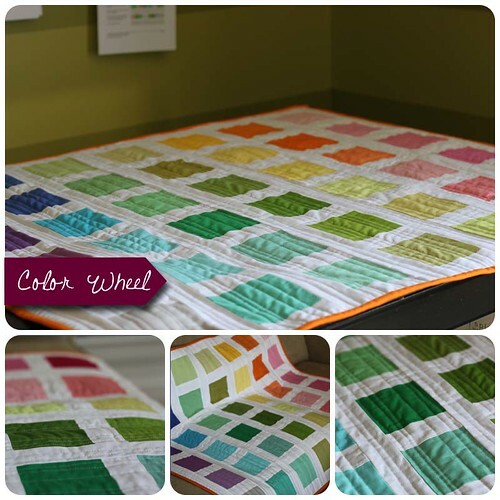 Free motion quilting will be up next. The back is some IKEA fabric we picked over Spring Break. 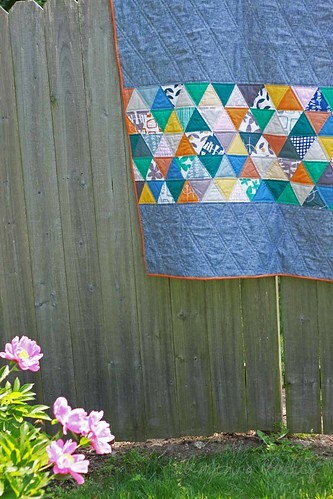 And I may have discovered a new quilt picture-taking spot. Unfortunately those flowers only bloom once a year and the entire street can see me battling to take a picture of a quilt. Over a fence. In the wind. I did some google researching and most of what I came up with was about aging real brass. At 1.15 a pop, I knew my handles were not the real thing. The tint and high sheen also would indicate that. 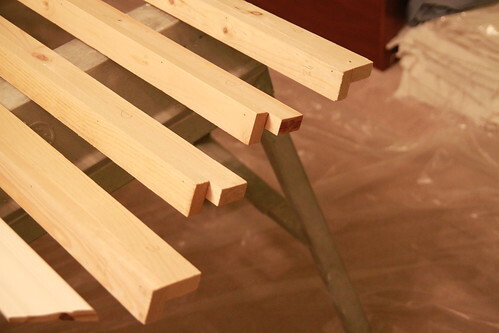 I did find some suggestions about sanding them down before painting them to take off the shine. Way too many handles for that. We had some extra pulls, so I got some plastic cups and let one soak in acetone and one in white vinegar overnight. I looked at them the next morning. Still shiny. And they continued to shine the after another night of soaking. So I took them out in frustration and to do some more research. Because I was.not.going.to.sand. 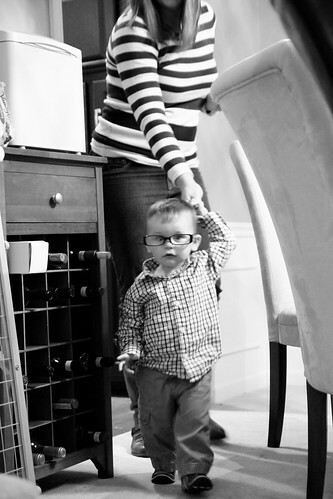 The next morning, something miraculous happened. Yes! I was doubly excited because vinegar is also cheaper than acetone and not a toxic chemical. 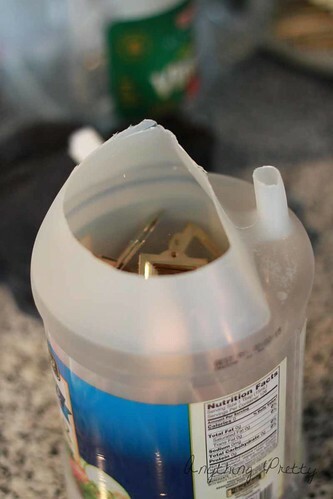 In effort to save containers, we dumped the handles into a gallon of vinegar with the top cut off. It soaked overnight. And then laid it out a trash bag to let the air do its magic. 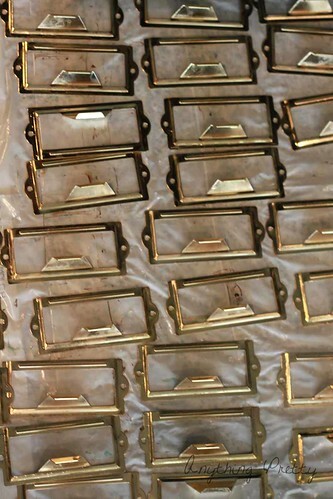 After a day we washed them off in warm soapy water and had old looking brass. With each looking a bit different. The “new” finish held fine during install and all the handling involved in that. If you were using this technique on a handle was going to get touched on a daily basis, I would check to see how it holds up first. I assume it would be okay, but I did not try that variable since these are purely decorative. 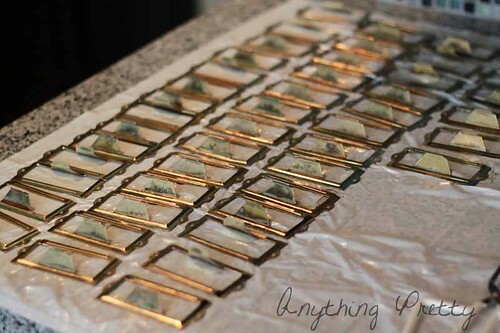 Also I am not sure how many different types of fake brass there are. This method may not work on all types. Moral of the story? Test your stuff out first to see what happens. I am just happy to find a method that was quick, easy, and cheap. And involved no sanding. I think I may have a new favorite DIY project. It was not super cheap, it was not quick and when I described it at the beginning of the project, people looked at me like I had three heads. But now we love it. Really really love it. (Photos taken in a basement with no natural light do not do it justice, trust me, I tried). 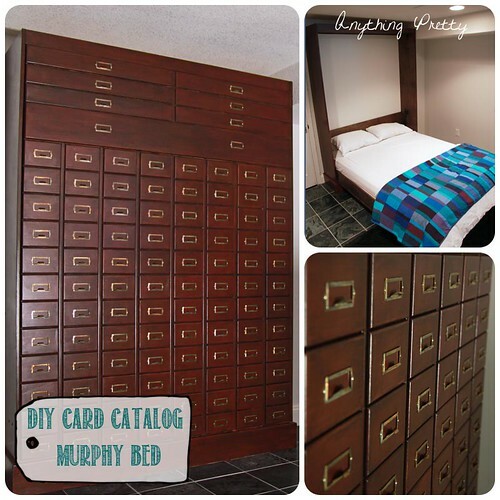 Why a Murphy bed? Well, we have a four bedroom house and we are not moving. 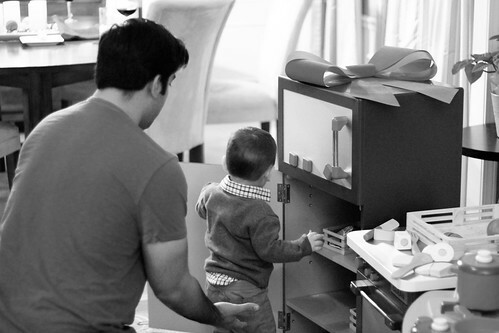 When we have another child sometime in the future, we will need that last bedroom. 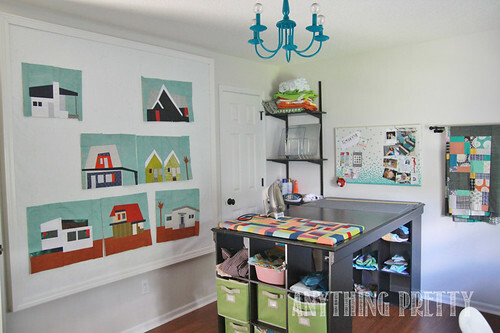 And getting rid of the craft room was not an option that I liked. The guest room was the least used, but with out of town grandparents, it was still a necessity. 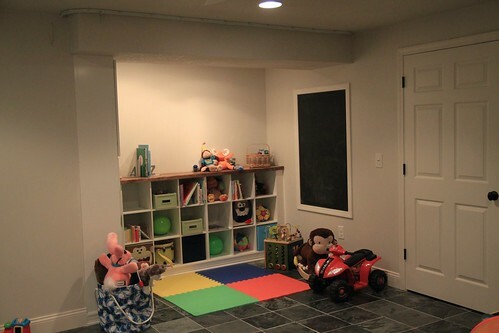 There is a bathroom in the basement, along with a TV and some empty space (and exercise equipment and a fridge and tons of toys if you are so inclined). Bingo. New Guest Room on an as needed basis. 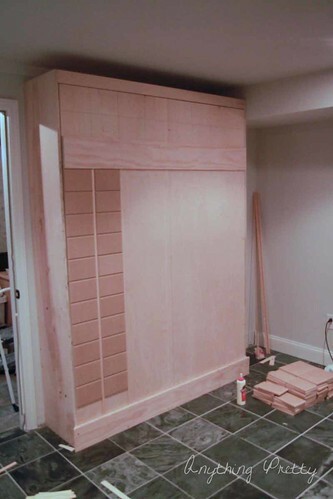 The bed was going to be Queen Size, so the cabinet was going to be a predominant feature in the space. 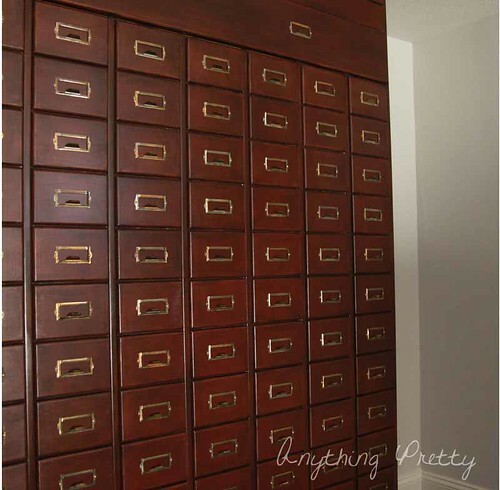 We thought about making the facing look like an armoire, but I wanted something more interesting. 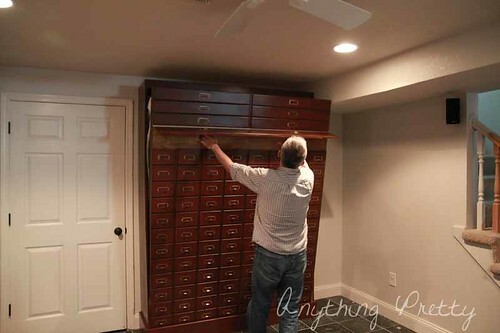 Enter the faux library card catalog. So how did we do it? We bought hardware that came with plans online (here). And Derek and my father-in-law built the basic bed according to those plans. They used predominantly plywood for the actual construction of the cabinet. 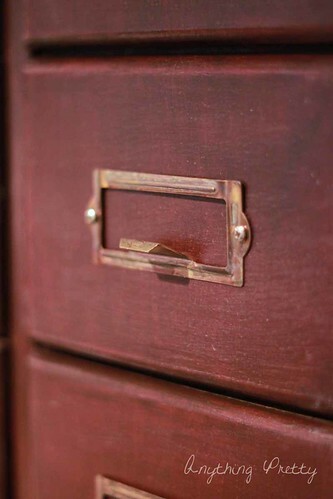 Then came the drawers. After a whole lot of math by the boys, we settled on 102 of them. 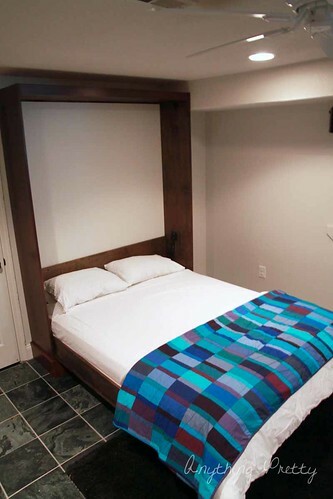 One of the challenges was the foot of the bed had to be in a certain place and a certain size. Since it would hold the bed while people were sleeping in it, it was important. 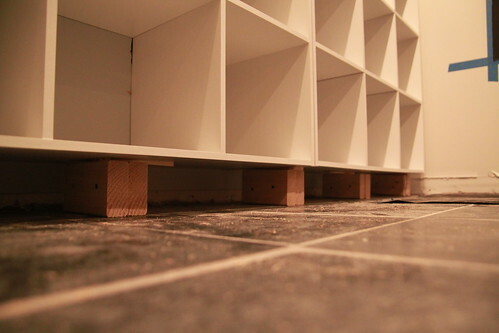 The drawers were cut out of 3/4 inch MDF because of cost. Then all the edges were routed. Bless my father-in-law with that stack of drawers. 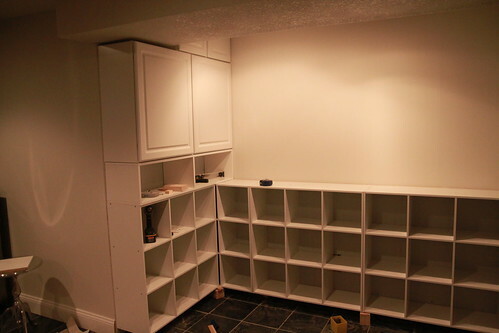 The drawers were nailed on in rows with a paint stick used as a spacer horizontally and flat molding nailed on vertically. 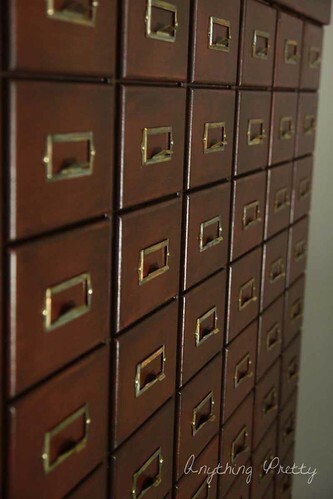 We talked about adding molding on the top or on the sides, but after extensive research on library card catalogs (I’m looking at you Google Images), we decided to leave it plain to make it more “authentic”. And then I finished it using a modified glazing technique. Which will be a story for a another post. Sneak peek: It took forever, may have involved some tears and cussing but I think the results were worth it. I learned a lot. Stay tuned. After it was finished, it was time to install the hardware. Which was another challenge with this project. When you need 102 pieces of hardware, they can’t be $7 a pop. Especially since they are completely decorative and non-functional. After much searching, I found my pulls here (but if you are buying them in bulk, check out their store on eBay). At about a dollar each they were the winners. 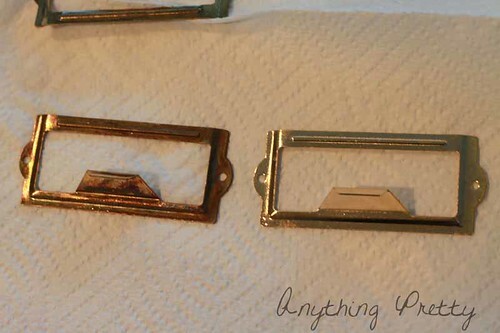 When they arrived they were shiny in fake brass kind of way, so I aged them. I tried a variety of methods with different results, (bringing me back to my junior high science fair days) with a clear winner. Again another post. Now they look old and worn. Derek constructed a jig to make sure they went on straight. And then he had the super fun task of screwing on every.single.one. We brought down the mattress from the guest room, and the new guest suite was born. Just pop open the leg and the mechanism releases. Add some pillows and a quilt and we are ready for guests. And the majority of time when it is closed and being played around, it is just nice to look at. And we can tell Carter about the good ole days when that was the way you looked up books. And he will look at us like we have three heads. Not bad for a incredibly functional yet nice-to-look-at piece of furniture. 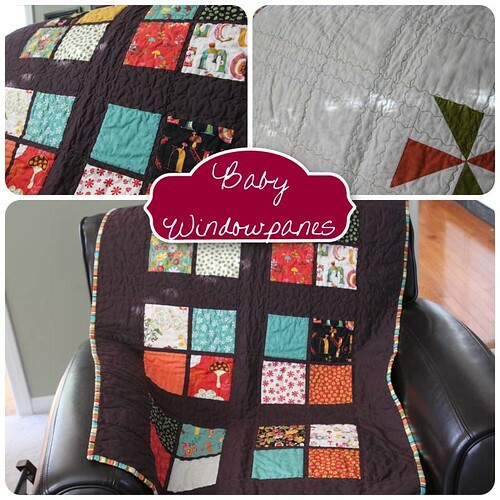 We loved this project (especially now that it is done) and it is DIYable. My father-in-law used to work as a contractor/carpenter so his skills were a huge help to Derek with the construction while he was in town. But if you are good with DIY and furniture building, we think you would be able to handle it, as the plans come along with the hardware. Also as I mentioned before, this was not a fast project. The actual construction took Derek and my father-in-law a weekend. But the finishing and the hardware application kept us busy for awhile. But worth it. What do you think? 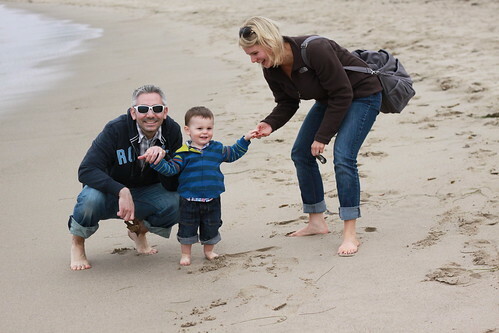 In the middle of some Midwest snow, we jetted off to southern California for our spring break. 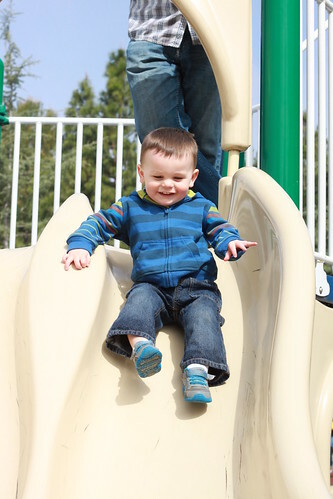 The thought of taking an almost two year old on an airplane for 4 hours gave us hives, but the call of sunshine and grandparents was too much to overcome. In the end, the plane ride turned into 6 hours because of the airline computers completely crashing. And he was a champ. Whew. 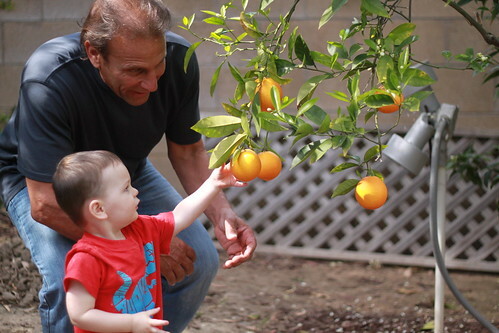 1) We discovered Carter’s love of picking fruit courtesy of my in-laws citrus trees. He may have a future as a farmer. Who picks things one at at time and then throws it at the recipient. 2) Disneyland. Specifically rides at Disneyland that had continuously moving lines. Such as It’s a Small World. 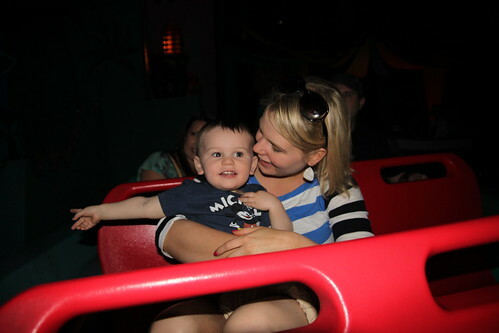 The teacups were also amazing…but the pain and suffering of waiting in a line that stopped and did not move for an eternity, at least in toddler minutes, was almost not worth it. OK the video of the joy on his face while we spun would make anything worth it. But at that moment, there may have been threatening of us leaving. 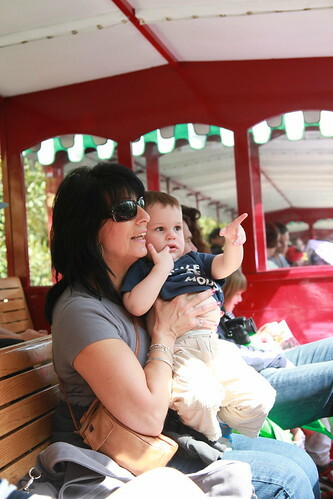 And honestly he would have been happy riding the train all.day.long. 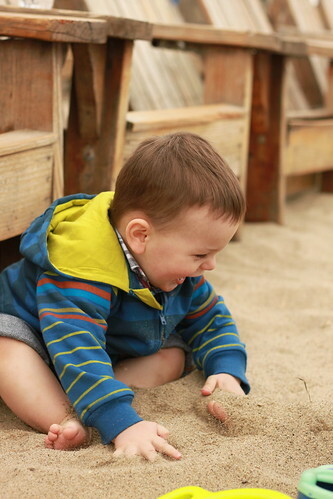 Oh the sand. And the shells. 4)Travel Town. Lots of trains-no further explanation needed. 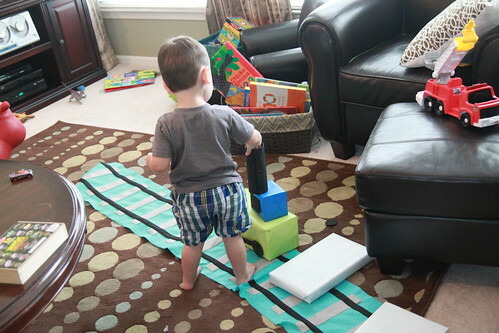 He takes his train riding very seriously. 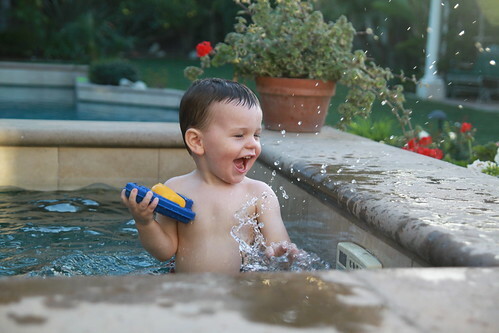 5) Swimming in his grandparents’ pool. Oh the joy. 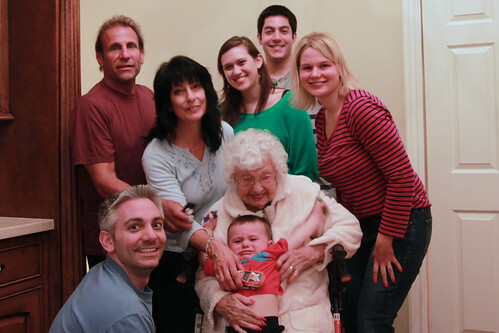 6) Meeting Big Nonna. And spending time with family. That one is going on the mantel. 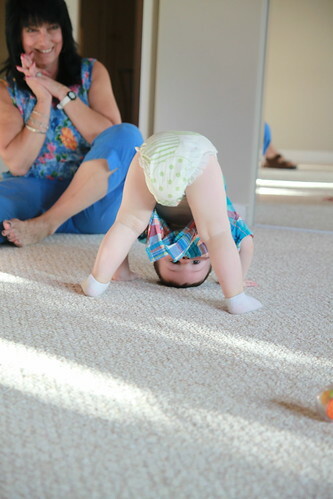 7)Goofing off and just playing. Sigh. His expression in this picture is deceptively pleasant. 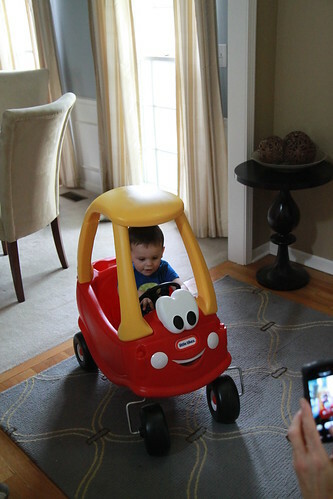 The whining and throwing of every toy (and phone) we gave him for entertainment was not captured. 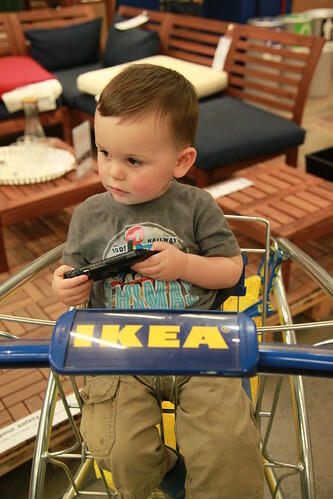 And we thought we were raising him right to respect IKEA time. My favorite part about vacation? The sun. And toddler naptimes by the pool without any guilt about what I should be doing. I was accidentally unplugged all week by way of forgetting my phone on the bathroom counter at home and remembering it halfway to the airport. After a mini freak out, I decided it would be nice to be free of it all week. And it was. Even though I missed posting pictures on Instagram of the fun in the sun. We all had a great time in the sun and with family. All of anxiety about time changes and lack of naps was for nothing as he rolled with it. Carter did get very sick right after we got home. While it was snowing and my sunburn was fading under sweaters. Natural consequences of licking carousel horses at Disneyland. 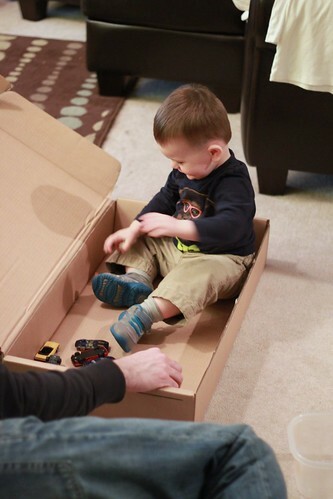 And Carter got a new box to play with. Win win. 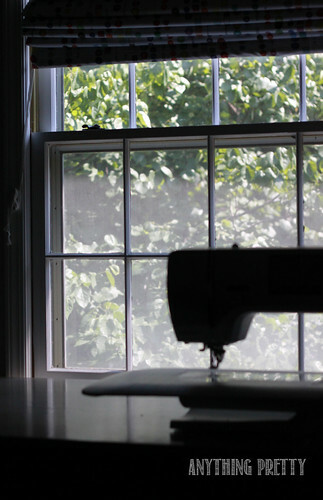 Did I need a new sewing machine? No. 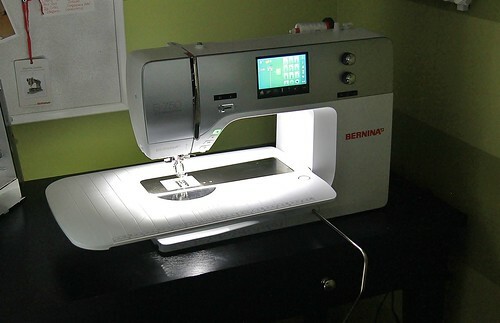 My old Bernina was still doing great. But it was missing a number of things that you can’t get on a mechanical machine. My grandmother passed away a couple of months ago and with the money from her estate we wanted to get something to remember her by. Something that 10 years from now we wouldn’t have to try to remember what we had used the money on. Something that when I look at it, I will think of her. For my other grandmother, it was the grandfather grandmother clock that sits in our foyer. But we did not need two clocks. We kicked around a couple of ideas, but nothing was perfect. So we did nothing. Then Derek mentioned a sewing machine. 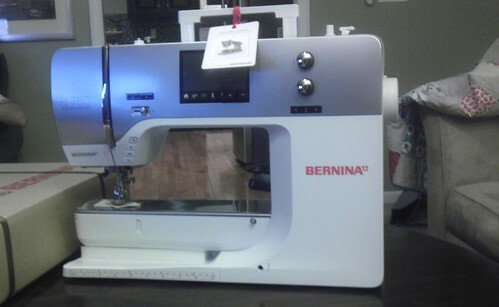 The one I had gushed about months before (the Bernina 750) but then promptly did not think much of because of the price and the “lack of need” for a new one. He is awesome. It would be something that would bring me a lot of joy. And something I will use very frequently. Perfect. 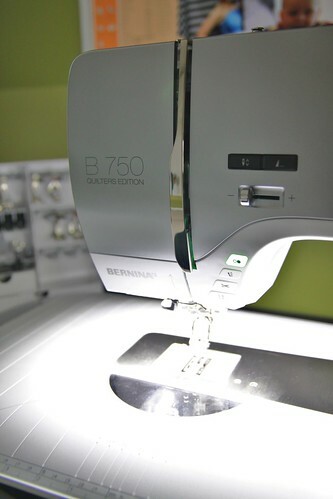 I had loved my previous Bernina and when the new 7 series came out, I knew that’s what I wanted. There is a bit a learning curve obviously going from my old machine to the new one with all the bells and whistles. And with a touchscreen. It is much larger (and heavier) than my old one. When we get to know each other a little better I will do a more thorough review of what I like and don’t like and specifically why I chose this machine. What about my old machine? We thought about trading it in, but we decided to keep it and house it in the basement. One of things I do not like about sewing is how solitary it can be. Just me and my room. Carter has limited interest of playing in there and honestly with all the pins and rotary cutters, it is not best place for him. So my hope is to be able to do some simple piecing on old machine while he is playing in his area in the basement. 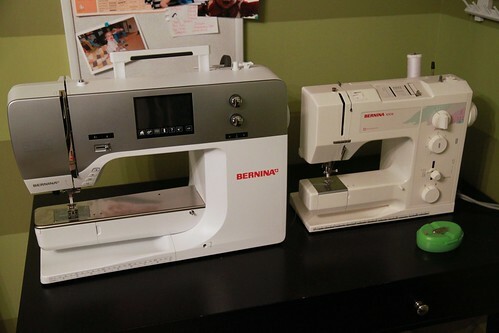 And since Derek has already won the “best husband” award, the man room will now include a sewing machine. And my old will be the machine I travel with to sew with friends. Which happens more often than I would have thought. 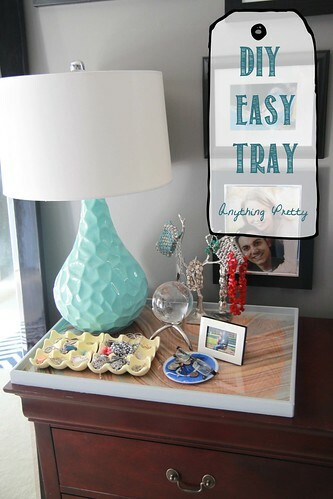 I love trays. 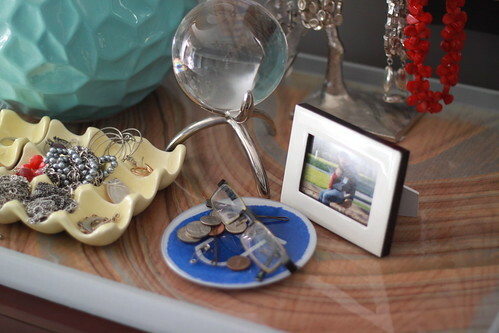 You can have a random collection of stuff sitting on a flat surface looking a whole lot like clutter. But with a tray, presto. It looks deliberate and styled. Magic. 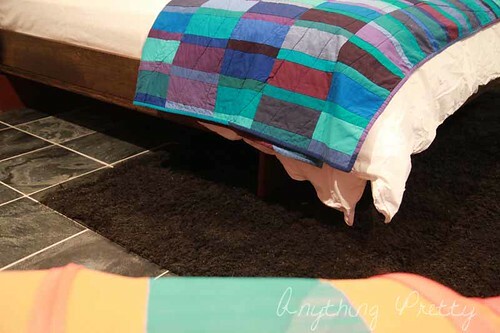 Over the past couple of months, we have been trying to spend a little time spiffing up our master bedroom. The room that one could argue should be a top priority had been getting the short end of the decorating stick. 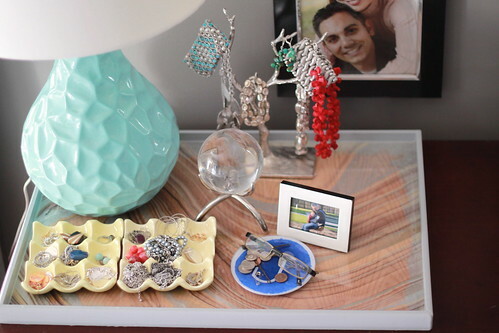 So I wanted a tray for the top of my dresser. And I wanted it to be a very specific size and color. DIY project time. 1. 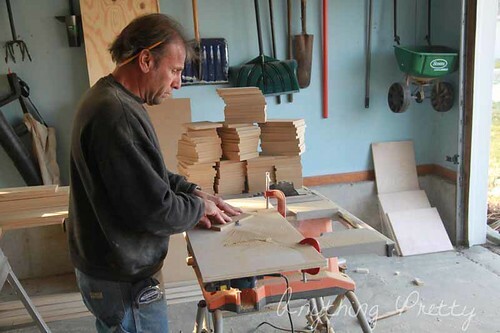 Cut you wood to the desired shape. 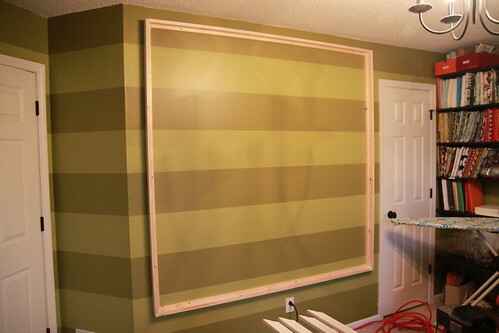 Nail the molding to the side with 90 degree miter cuts at the corners. 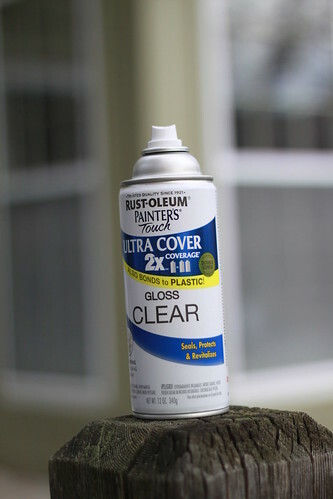 Use caulk or wood filler to hide the corner seams. 2. Prime and then paint the sides. Here is where I tell you not to do what I did. Either stop the paint before you get any on the tray edge. 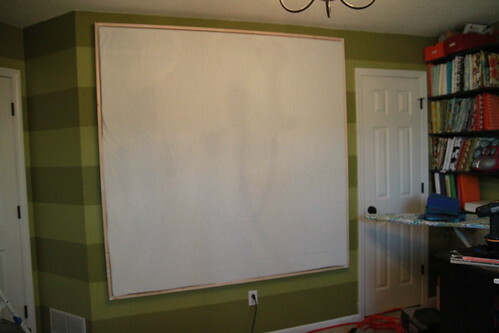 Or paint the ENTIRE thing. You will see why in a minute. 3. Poly the sides. I used a spray. 4. 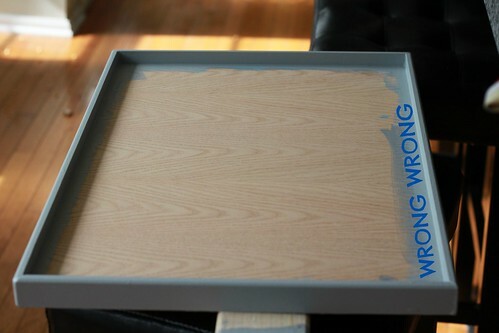 Cut your paper to the exact size of the bottom of the tray. 5. Dry fit it and then spray a light coat of spray adhesive to adhere it to the bottom. 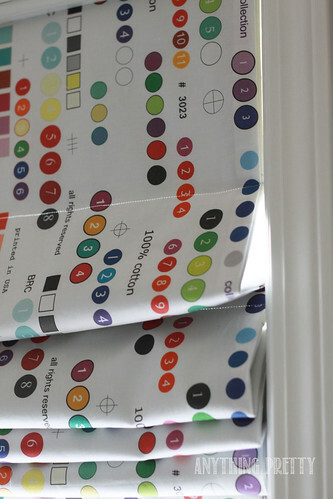 You could probably skip the spray adhesive and be fine if your paper is a tight fit. 6. Mix your resin and pour according to the directions on the packaging. This is when my mistake became apparent. 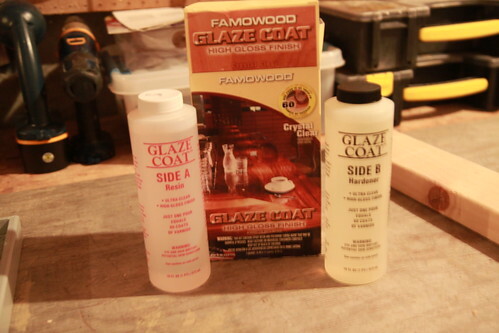 With the resin, my paper became translucent and you could see the wood grain…and my paint line. I did not mind the grain, but the line annoys me. Not enough to redo the whole thing, but enough to tell you about it. Oh well…learn from my mistakes. 7. After the resin hardens the amount of time on the packaging (I believe mine was two days), put your crap in there and watch it become collection-like. 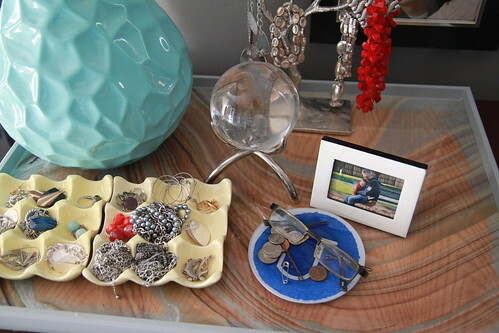 My tray is my dump all on my dresser. And the place where I keep my favorite jewelry. Having it out and seen makes me wear it a whole lot more. And every once in a while I rotate it around. Not to mention I love the marble paper (found a local paper store). And I choose to ignore the blue peeking through. 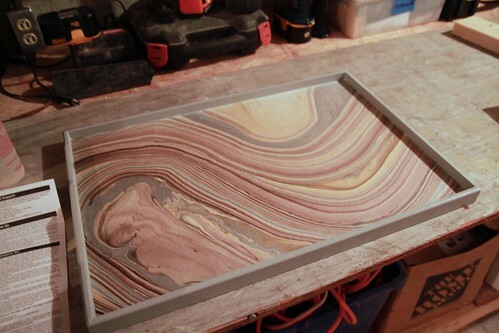 I have been dumping stuff on the tray for two months now and the resin has held up beautifully. 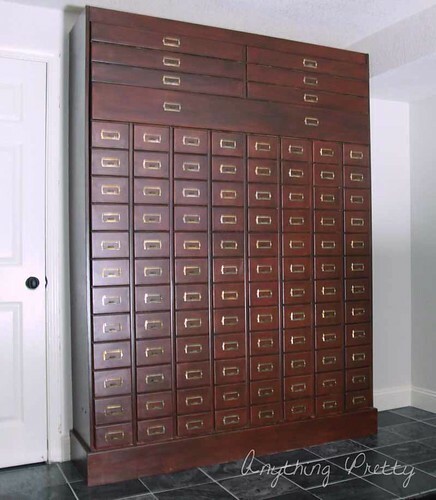 This will be my go-to project for any space that needs some spiffing up. Next time I will do it properly…or choose some thicker paper. I pin a lot of things. And I have grand plans to complete oh 85% of them. But somehow that does not happen and my pins just sit there looking pretty on my boards. Maybe even mocking me a little bit. 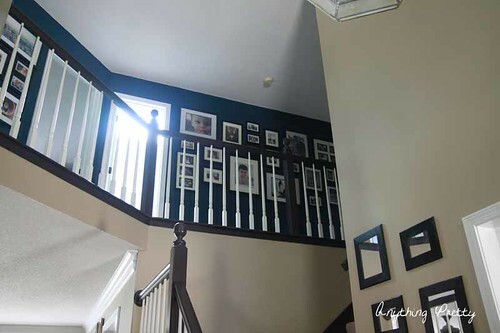 As part of the Pinterest challenge over at Young House Love, Bower Power, Decor and the Dog and The Remodeled Life I decided to change that. I probably should have chosen a faster project, or at least one with less drying time. But thanks to two blizzards and days off work, this one got done. 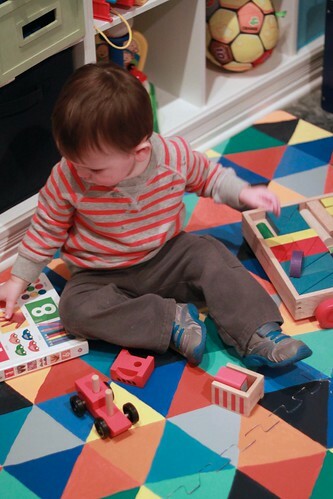 Carter needed a play mat for his playspace. And it needed to be indestructible. And easy to clean. Not to mention attractive. Finding nothing that fit the above criteria, I decided to DIY. The basic how-to is pretty simple. 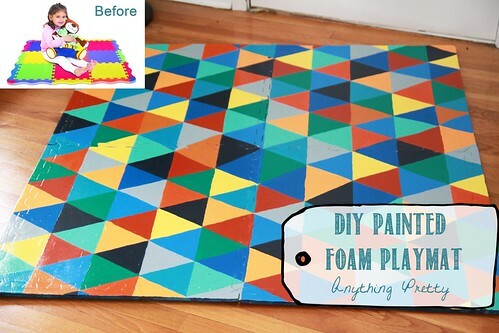 Buy a cheap foam play mat, prime the non-bumpy side and paint with acrylic paints. Finally seal with a couple of coats of polyurethane. 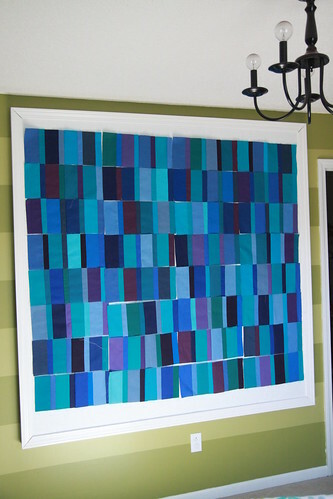 Easy and quick if you decide to make a large scale design with a couple of colors. Small triangles on the other hand took a while to paint. Especially since it took multiple coats to achieve color saturation. 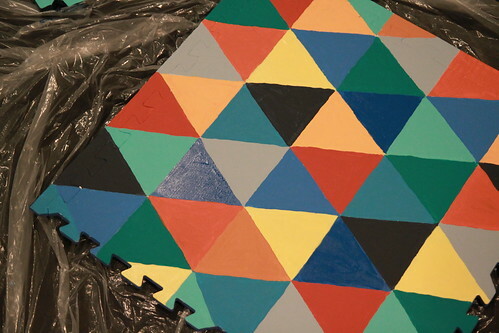 But it was easy to paint while I was watching TV and somewhat relaxing to do- triangle after triangle after triangle. 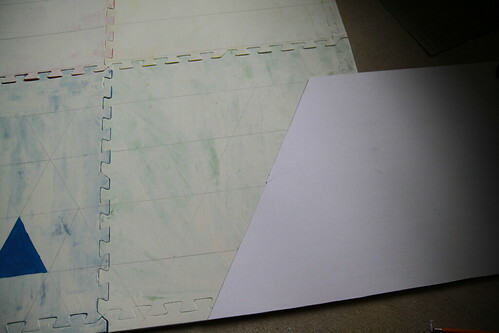 In order to draw out the design, I used my sewing cutting mat to make a template out of cardboard of a 60 degree angle. And then used the template to draw in the angles. My triangles are approximately 5 inches. I mismeasured at some point and my triangles got a little jacked up in the middle. I figured out my mistake, but did not want to re-prime and re do all my lines so I decided to channel my inner Tim Gunn and “make it work”. 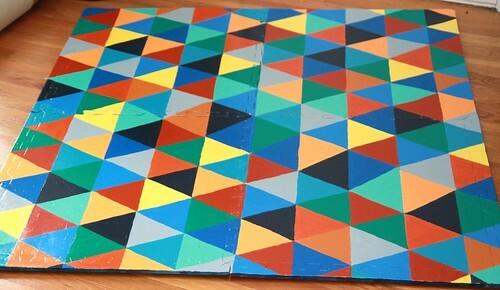 I did not use tape to paint the triangles with the acrylic paint, so my lines are not perfectly straight but I like it that way as I think it looks more hand-painted. At least that is what I am telling myself because it would have taken forever to tape. Three coats of gloss polyurethane later, we have this. All ready to be played on. 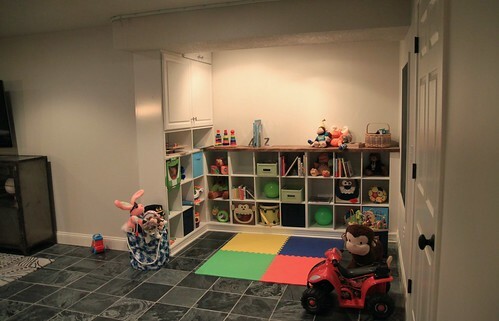 In the basement play space that almost gets no direct light for decent pictures. Especially when there is two feet of snow outside covering the windows. 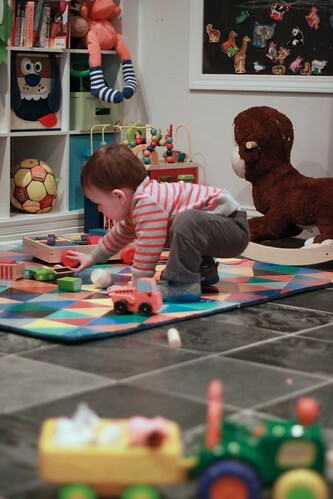 The play area has had some other projects go in it, but I waiting until everything was done to blog about the space. The rug was the last one, so that should be coming up. So how does it hold up? It has not cured the complete 24 hours as instructed but has already held up to books being dropped on it and a rousing game of stacking and knocking down blocks. Before the poly went on, it seemed like it would crack easily. But with the poly it seems a lot more pliable. I will keep you posted. For now it is a hit. And I am not painting triangles for awhile. 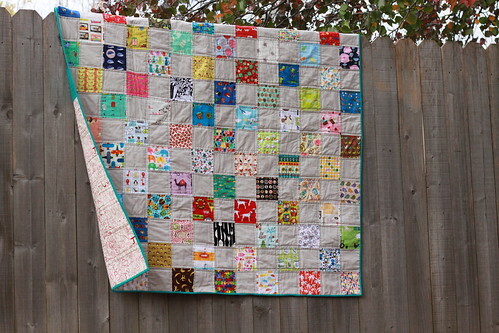 Meet my old quilt design wall. 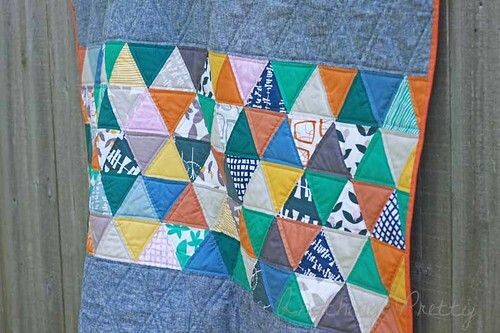 Difficult to visualize quilts on. Especially without a ladder. And prone to destruction by toddlers, dogs and the vacuum. 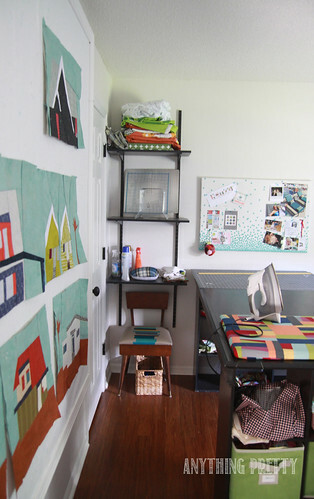 I am lucky to have a devoted space to my crafting and even luckier to have a huge free wall. 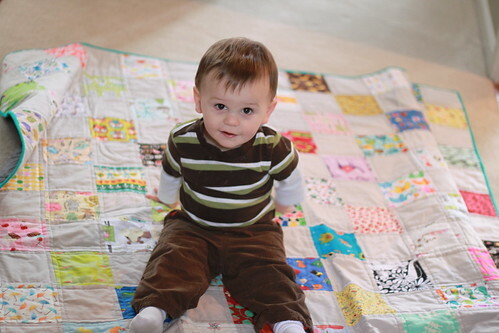 Derek was not well versed in quilt design walls for some odd reason. I explained the basic premise of wrapping batting over something light so that cotton fabric would stick to it. 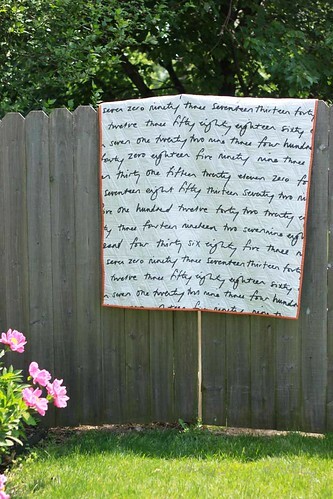 And it should be large as we had about a 7 foot square to work with. And since it was going to be permanent, I wanted something that looked nice. And not temporary. Almost like a framed piece of art. 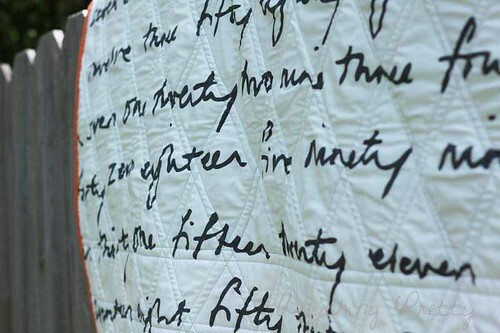 Well the wall, not the quilt. That was me. But you get the idea. So how did we do it? Here is the how-to if you want your own. This makes one approximately 6ft x 6ft design wall. 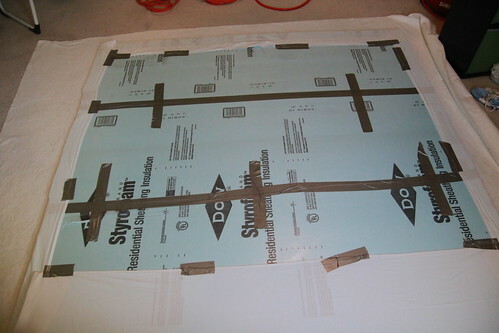 Foam backing for vinyl siding equal to the interior of the frame size. 1. 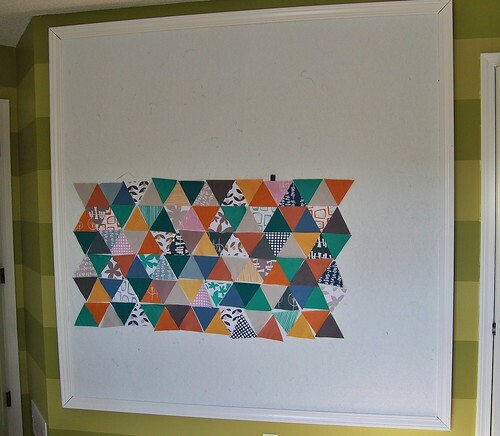 Make an L-shaped frame out of 1x2. Use 8 1x2s to make 4 “L’s”. 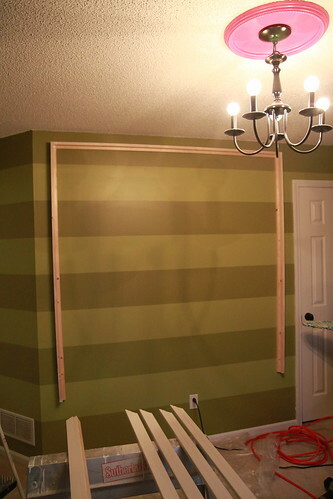 We used a nail gun and finishing nails. 2. 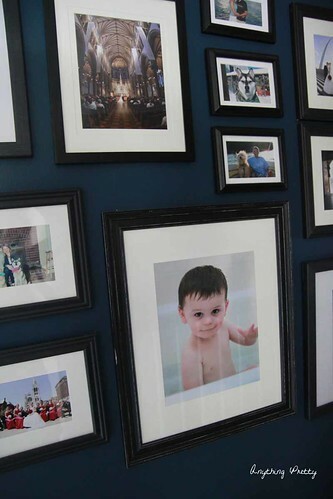 Screw your four L’s into studs on the wall in a frame shape. 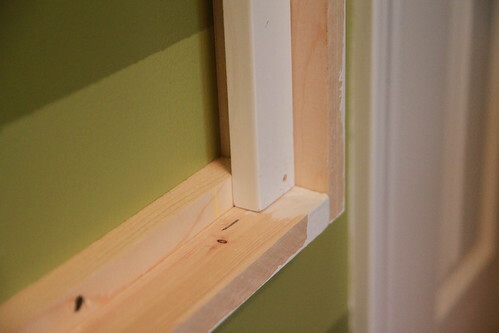 By making the L shaped frame out of 1x2 it provides a 3/4” interior lip to screw into the wall and creates a 2 1/4” inch frame that is perpendicular to the wall. 3. 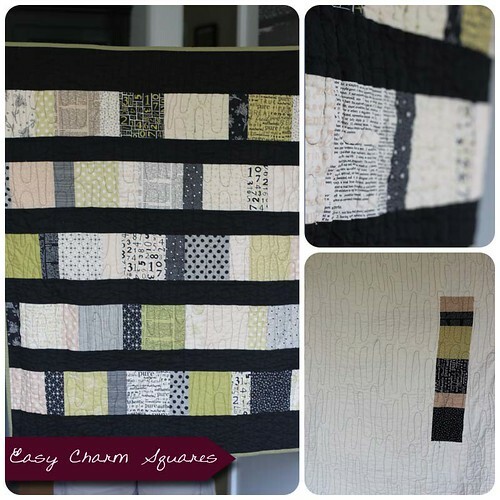 Cut up a 1x2 into 2 pieces that measure about 1 foot a piece. This does not need to be exact. 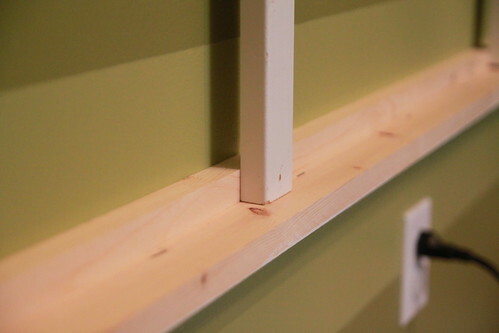 Install these two pieces horizontally into the studs in the middle of the frame. These will serve as supports for the vertical pieces. 4. Nail 4 1x2s as vertical supports-on the two sides onto the frame and two in the middle, crossing over the horizontal pieces in the middle. 5. 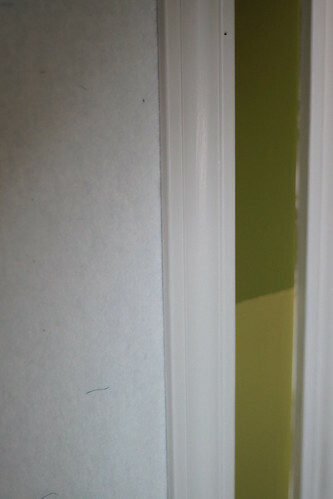 Paint the exposed edges and the molding. I painted before we started anything and tried to be strategic about only painting what was going to show. 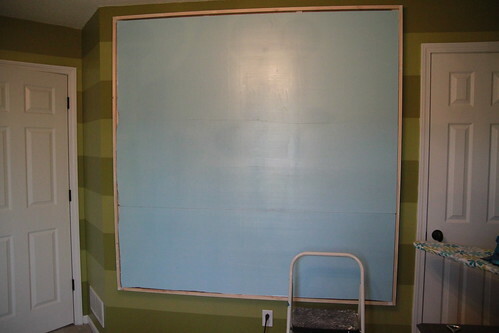 However, as you can see by the painted 1x2s above I over painted. 6. 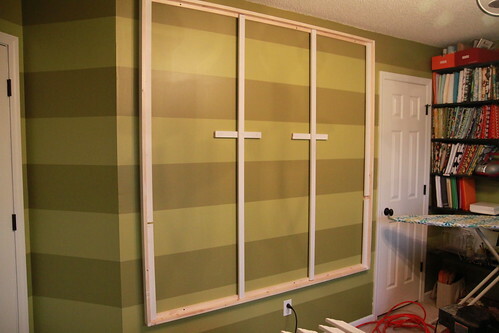 Measure and cut your foam (the kind they use behind vinyl siding) to your inner frame size. Make sure it fits with a little bit of space on the edges (about a half inch). He had to duct tape two pieces together to get one this size. 7. Wrap that sucker with batting. We secured it with duct tape on the back and stuck a couple straight pins in the front close the the corners. Pins/staples/anything sharp would be a bad idea on the back because of the potential poke factor on the front. 8. Stick it back up there inside the frame. 8. 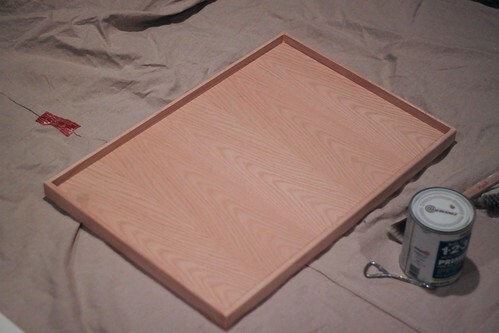 Cut molding to fit the frame and nail it to the edges of the wood around the frame. The batting layer is now enclosed and won’t move. 9. 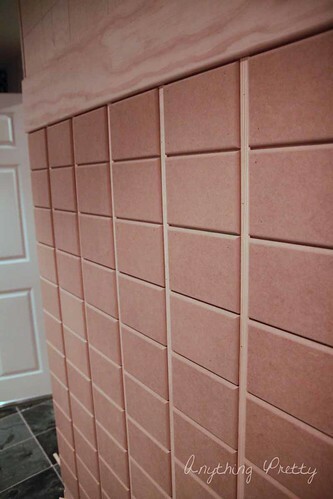 Caulk your nail holes and your mitered edges. Honestly we still have not done this step. It is functional without it but prettier with it. I have been using my design wall for awhile and it has been invaluable. The cotton fabric just sticks right to the batting. It is like temporary art. Right now it is sporting some triangles. 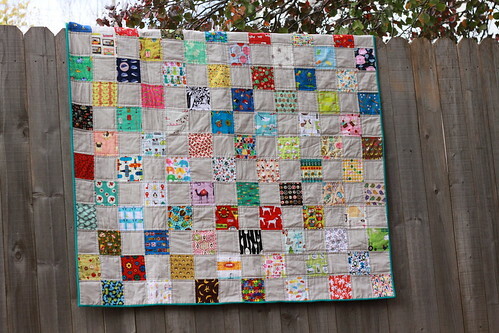 I received a couple of charm packs of Lotta Jansdotter’s upcoming line- Glimma and after adding some solids (all from my stash) the design wall was put to great use. Making sure the triangles were not forming any funky shapes. And that the colors played nicely together. Because random takes a lot of planning. That is what a design wall is for. And providing great fabric to look at while I sew. 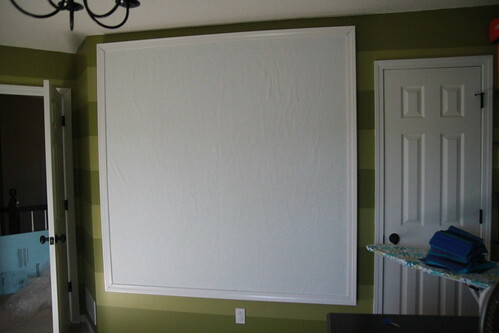 Hmmm….maybe I need two design walls. 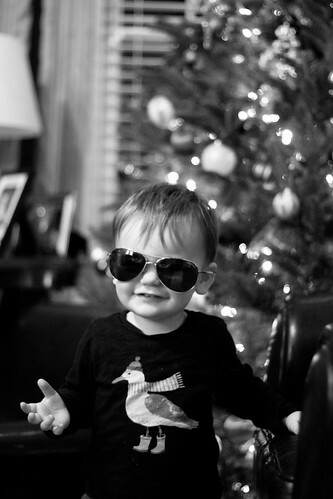 Christmas is so much more fun with a child. Or baby. Or toddler now I guess. 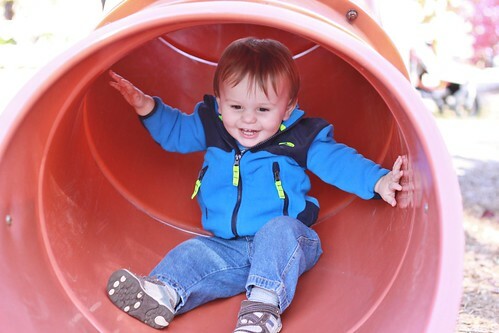 And while last year was great with him being 5 months old, this year was even better. I am sure I will say the same thing next year. All the planning and wrapping and shopping and cooking and decorating is worth it again to see him on Christmas loving every minute of the festivities. We were fortunate that we did not have to travel, but we hosted two large groups of family within a couple of days of each other. And we still have one more Christmas this weekend to go with another set of grandparents. 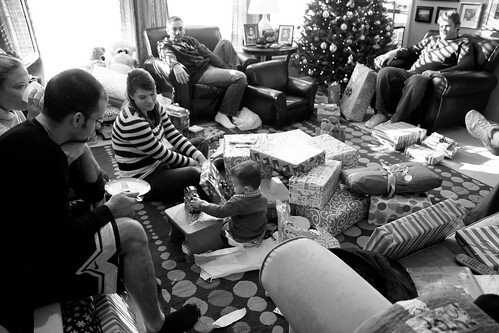 Notice how everyone else’s present pile pales in comparison. 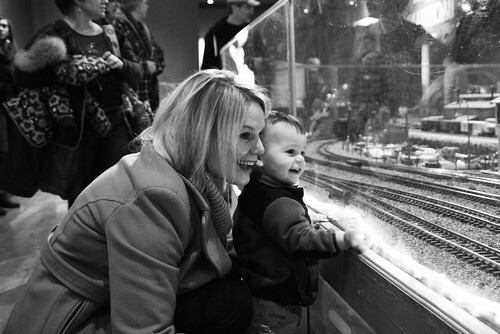 We saw the train exhibit on Union Station which was a huge hit. 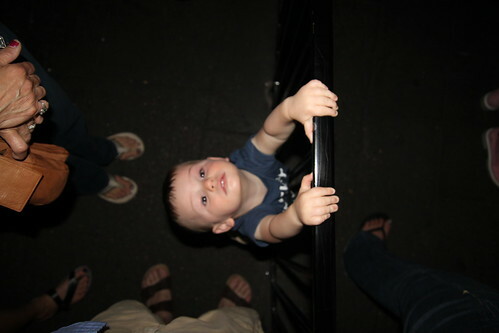 And in typical 17 month old style resulted in a Category 4 temper tantrum when we left. I look forward to being able to bribe him. Because screams sound awesome in marble halls. 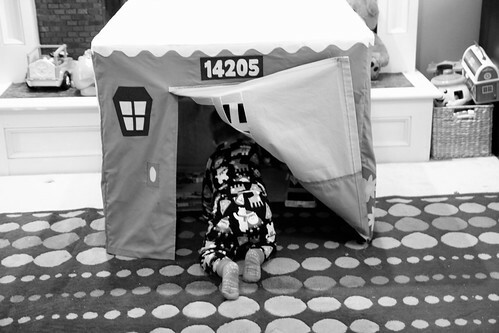 The card table playhouse was a success in that he went in it a couple of times. As was the new kitchen from Santa. And we even had some snow. Not on Christmas. But close enough. So all in all we had a very merry Christmas and enjoyed it thoroughly. We are blessed. I hope you all had a great holiday season and a happy new year. Bring on 2013! 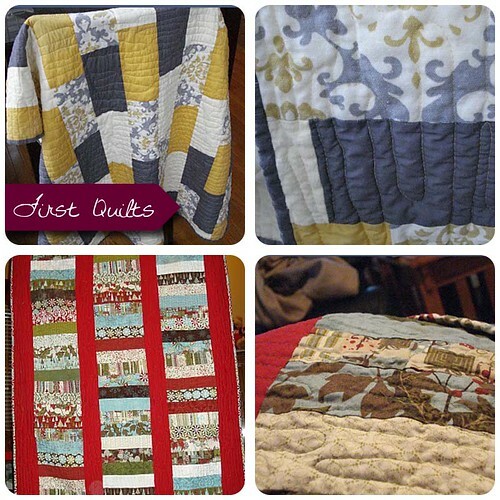 Every year while I am working on handmade Christmas gifts, I run into the conundrum of wanting to post all about…but knowing the recipients read the blog and could ruin the surprise. On the other hand, posting about handmade gifts in January is no fun either. Luckily this gift is going to someone who does not read my blog. 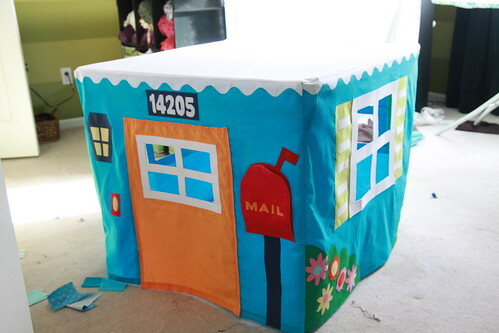 A card table playhouse for the little man. 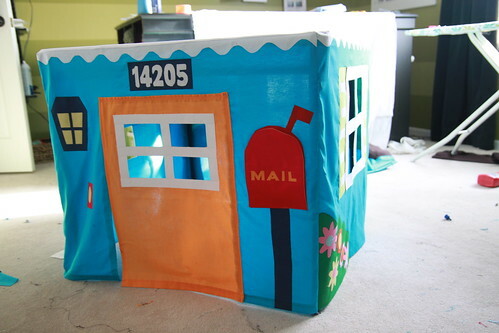 With windows and doors and a mailbox that will include a letter from Santa. Or he just may like opening and closing the mailbox flap 436 times. I am going with that. And the best part? 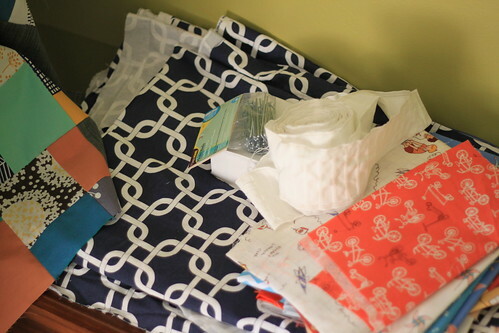 When he (or his mommy) gets tired of it, it folds up in a small little bundle and you are left with a card table. Which collapses as well. 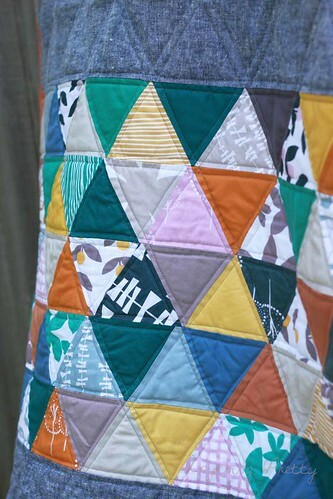 I used a pattern from Empty Bobbin Sewing Studio which was fabulous as I could have never come up with it myself. 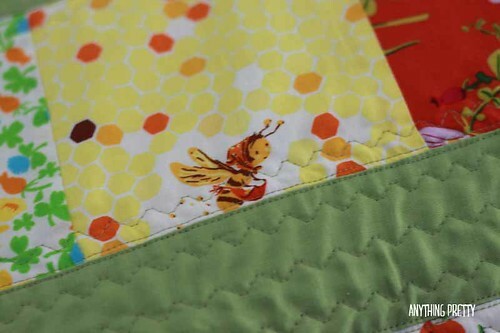 She has lots of other patterns as well which are in my to-do file. 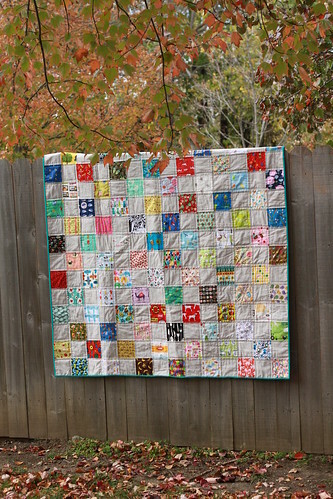 All the fabric is Kona solids. I used the number of our previous house for a bit of nostalgia, which in retrospect will probably confuse him for years. Oh well. It still needs a good iron and to get out of my disaster of a sewing room (there are other gifts being made you know), but that will have to wait until Christmas morning so he does not ruin the surprise. I am planning on putting a big Lexus-esque bow on it. I hope he loves it and spends many hours playing with it. Since I spent many hours making it. I am hoping it his favorite toy until he is…oh 15?? Would that be weird? I am linking up today with The Dare to DIY party hosted by 4 great blogs-Newlywoodwards, Décor and the Dog, Maybe Matilda, and Two Twenty One. 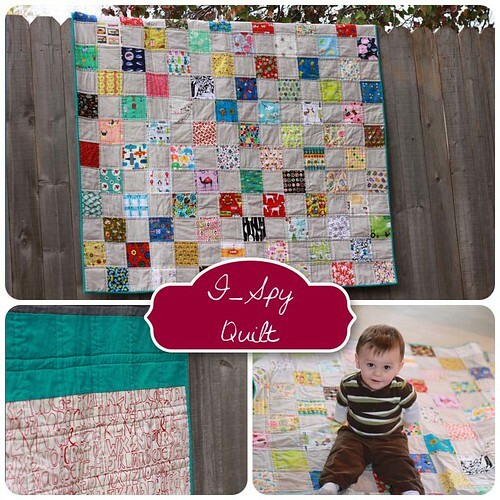 Go check out other handmade goodies! I know I know....Thanksgiving is not even here and I am talking about holiday cards. But we are on a quest for a reduced-stress Christmas. Which sort of sounds like a reduced fat Christmas, but assure you that will not be the case. Even though it is probably at the top of my thighs wish list. Anyway that means getting stuff done early. The majority of the gifts are bought and even the handmade ones are almost done. Maybe I won't be sewing all night Christmas Eve. Said the queen of procrastination. 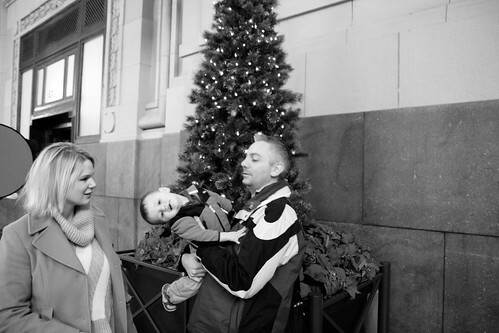 Getting a Christmas card picture was also on the to-do list. I had grand visions of recreating some pictures I took last year. With a cooperative and non-moving 5 month old. This is what we have this year with a 16 month old running toddler. This is the best we got so far. I am thinking I may have to let go of the light idea. But not having a picture has not stopped me from trying to find a card. 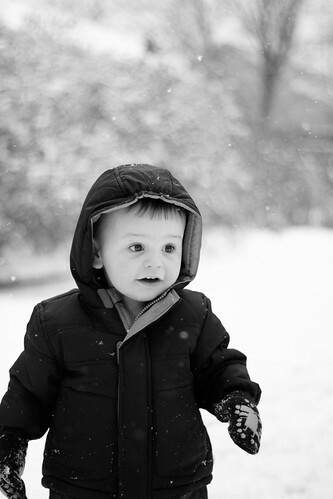 Since looking at all the pretty pictures on them makes my toddler photographing skills seem very inadequate. 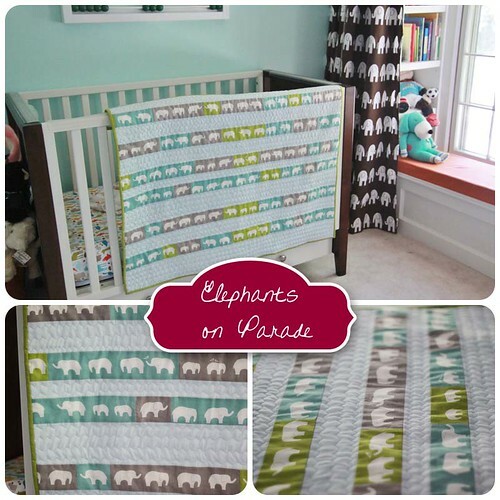 All of these are from Minted.com. 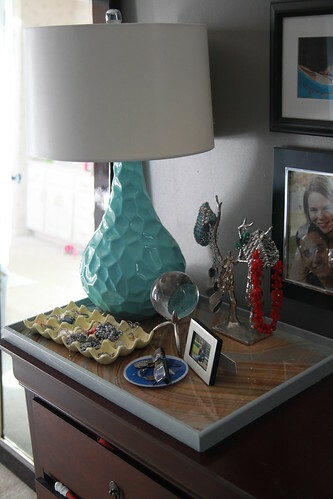 I love all the shapes they offer and that the designs are products of independent designers. And every time I look on their site I find another design to love. Now all I need is a cooperative toddler. Or someone to send a photographer to the house. 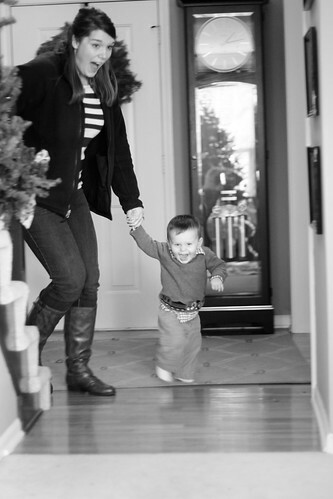 *Minted is supplying our Christmas cards this year. All the opinions and writing are my own and I just picked some of my favorites to share with you. But if you happen to receive a Christmas card from us, it probably won't be one of the above as there are just so many great ones to choose from. But it could include a crying toddler on it. Or his mommy. But someone is already a big fan. We can’t play “I spy” yet. But the “eh?” game is fun. In case you are not familiar with that one, it involves pointing to different pictures and saying “eh?”. And if people do not tell you what it is, you keep ehhing until they do. A little more strongly of course. Super fun. Oh and making sure the car squares are still there is another super important daily task. 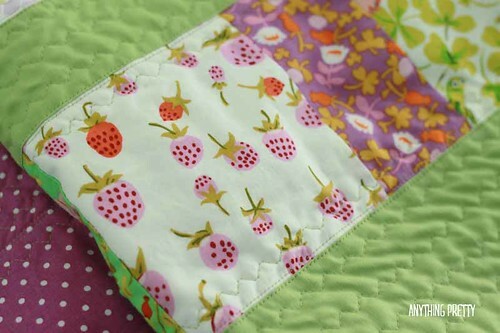 Awhile ago I participated in 2 swaps for different 5 inch novelty fabrics. I got lots of great ones and I knew whatever I made was not going to be a showpiece, but I wanted it to be as pretty as possible and tone down the busyness. While still making it fun of course. So ultimately I decided to do a simple pattern with Kona ash as the solid to hide the love I hope it will receive. There is so much fun happening on the front, I decided to keep it simple on the back. With some ABCs for some extra learning and ehhing of course. 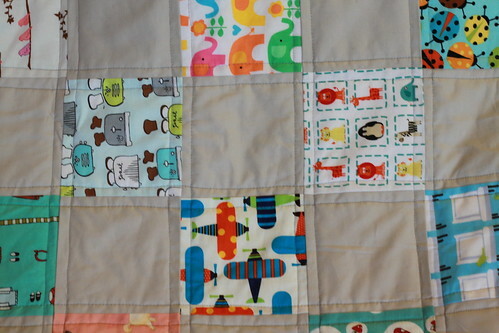 Since it was so busy, I also went with simple straight lines for the quilting. 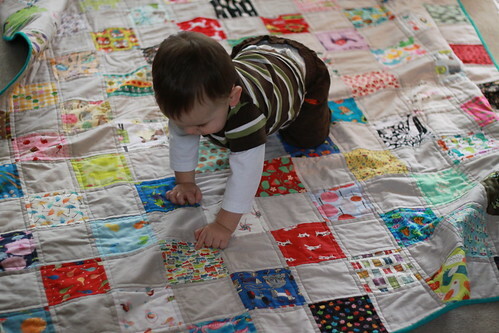 But my favorite part of this quilt is his insistence to look at it every day. And maybe even move beyond the ehhing game. Babies come with a lot of stuff. And toddlers add even more stuff. And rumor has it that kids bring even more stuff. 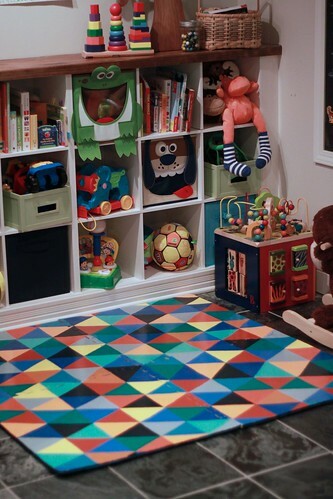 When we were planning our basement renovation we had kept that in mind, and the playspace there has its own corner to house a portion of that stuff. 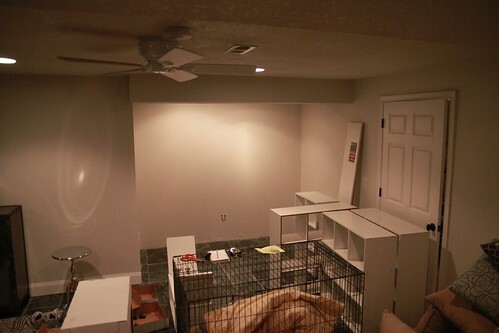 We wanted to make sure we made use of of the awkward space and had lots of storage. 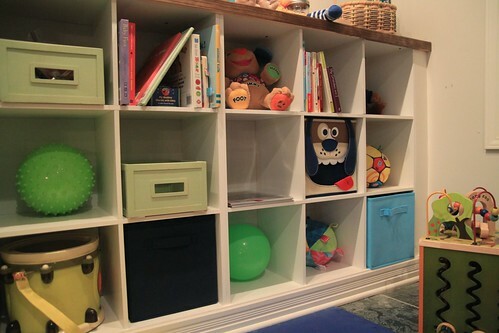 Some open storage for him to see his toys and some closed storage to him (and guests) not to see things. Like finger paints and crayons and markers for example. Or possibly the book we have read 2846 times. 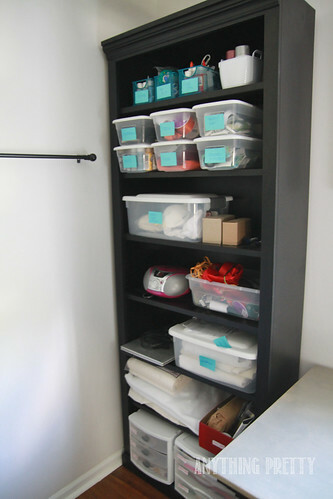 Originally I thought we would build something , but instead we came back to the old Closetmaid shelves that served us so well already as a craft table. With the idea of making them look less closetmaid-esque and more custom cabinet-ish. And he sat in one place and played without moving much. Anyway to make room for molding to increase the custom look, the shelves were installed off the floor and way from the wall. 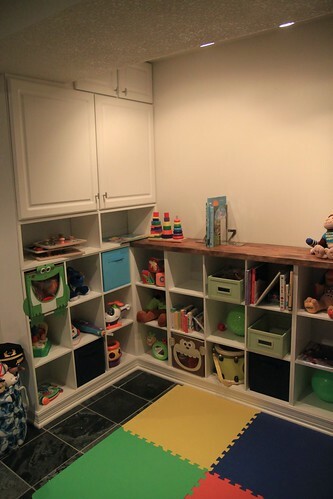 We also added some store bought cabinets around the awkward soffit to give us some closed storage. Disclaimer: It is impossible to take decent pictures in the basement that gets very limited light. And this is completely unstyled. Picked up…yes. Made to look pretty…no. We are only partially done. The rug is getting a DIY treatment and things are going on the wall. And see the track? 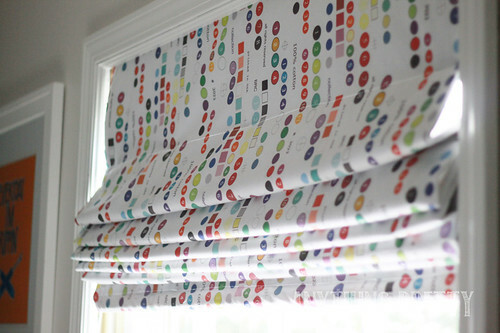 That is going to be curtains. That currently look like this. But for right now it is functional which is all that matters. The counter is a piece wood stained to match the fireplace and then molding added to the edge. And lots of coats of poly. So I have some sewing and DIYing to do. 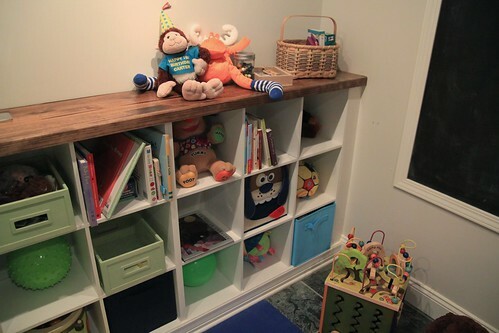 But we are happy how well some cheap shelves look in the space. 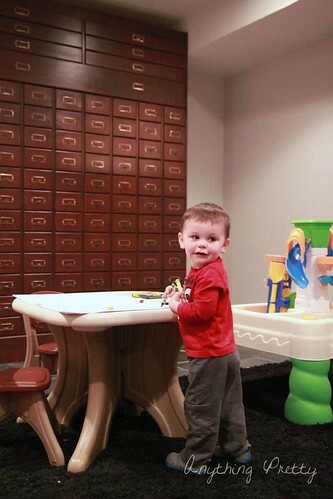 And maybe if I bring my sewing machine and paintbrush down there, Carter will sit in one place again and play. Right. I am an artist and this is my space to share all things pretty-home decor, art, DIYs, and creativity.